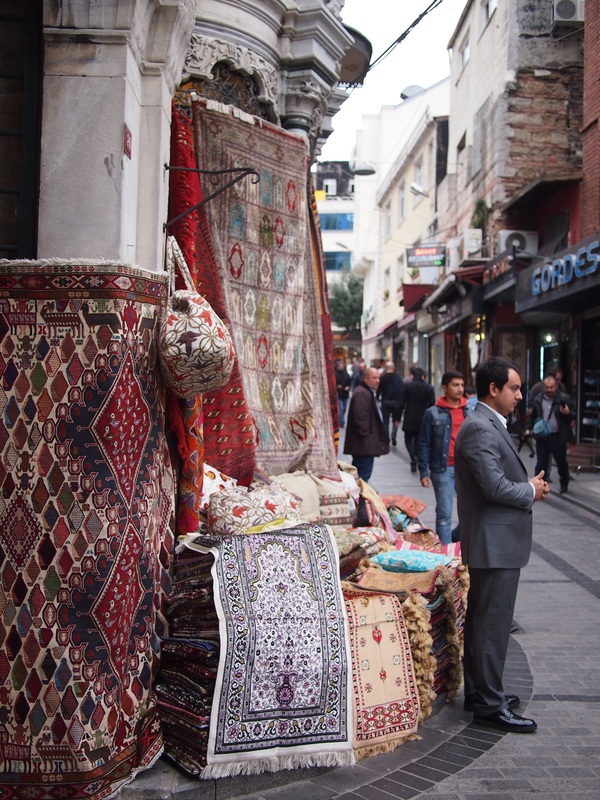 Istanbul is full of interesting places to shop. 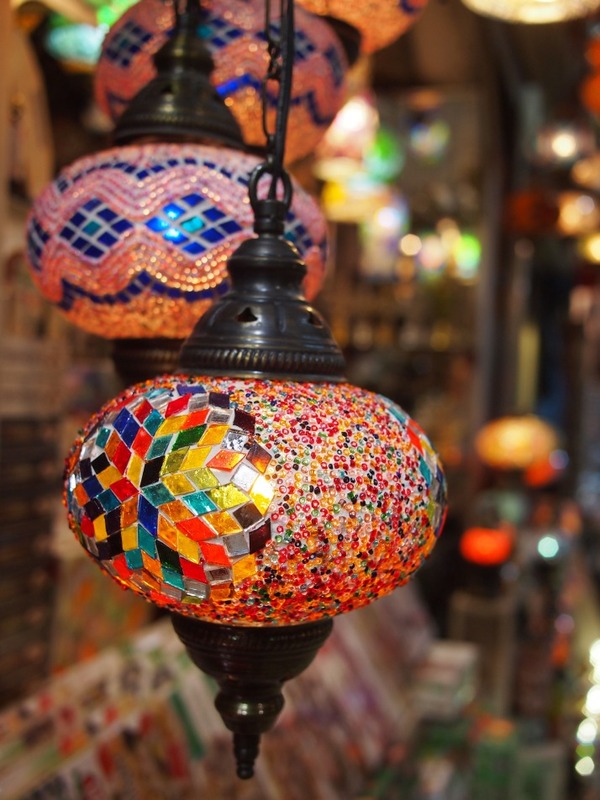 Even if, like us, you’re not interested in buying lots of souvenirs there’s a lot to see. 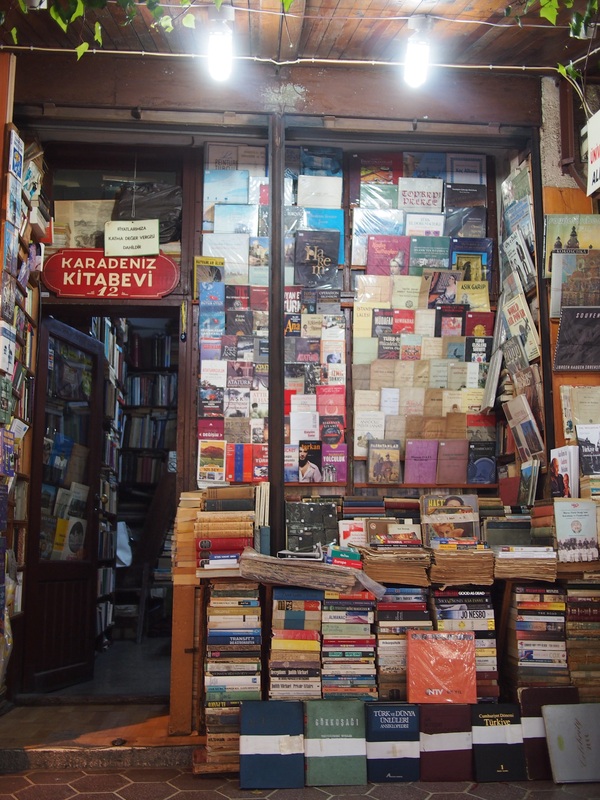 The walking tour that we took started at the Sahaflar Bazaar or book market, a small walled courtyard tucked behind Beyazit Square. We exited Sahaflar Bazaar through a gate which is just over the street from the most famous market in Istanbul, the Grand Bazaar. This is a vast covered complex which, even though it’s laid out in a grid, is incredibly disorientating once you’re inside. How big is it? 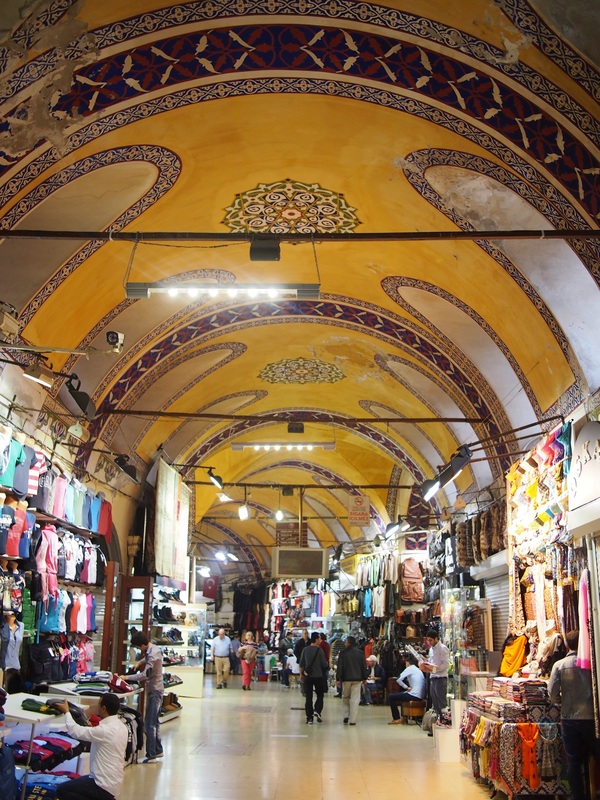 Well, it contains more than 4000 shops so you really could lose yourself in here looking at everything that’s for sale! Most of the shops are pretty small and so filled with merchandise that there’s no room for a kettle. Tiny tea shops send out runners with trays full of the typical tea glasses to keep everyone in the market going. 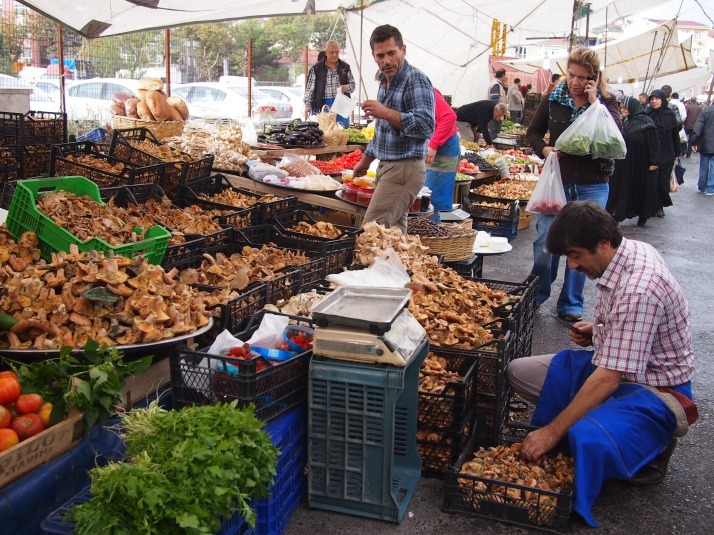 In the centre of the market is an area called the Old Bedesten. 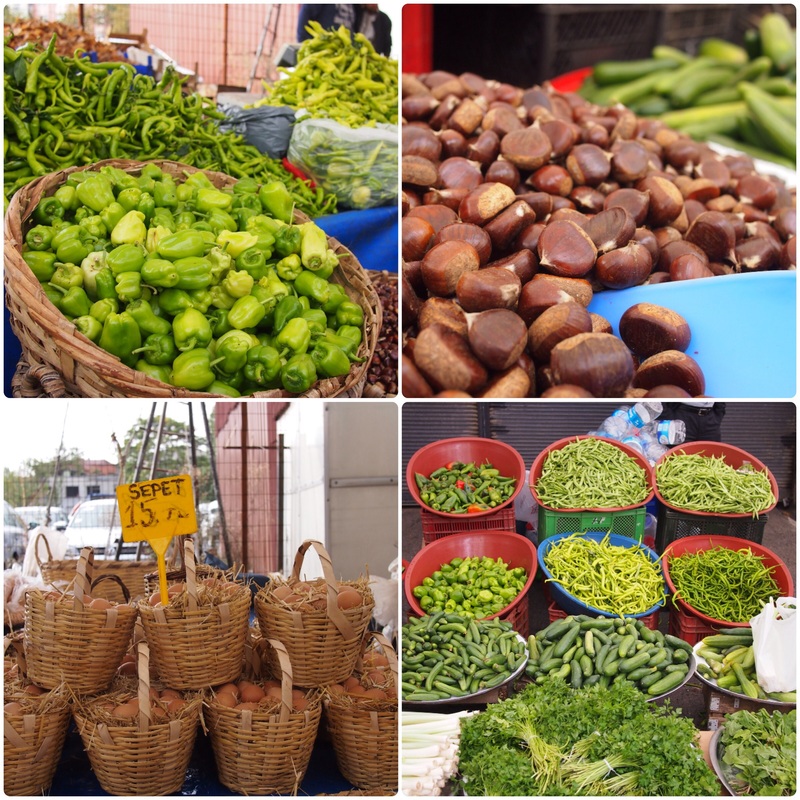 It is one of the original structures of the market dating back to the early 15th century. 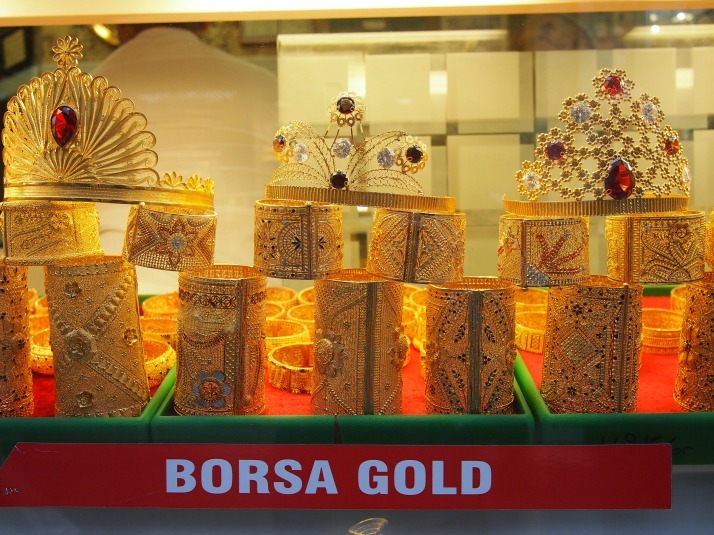 Historically it has housed the most precious of the market’s wares as it can be securely locked at night. Nowadays it is still home to some swanky looking jewellery and antique shops. 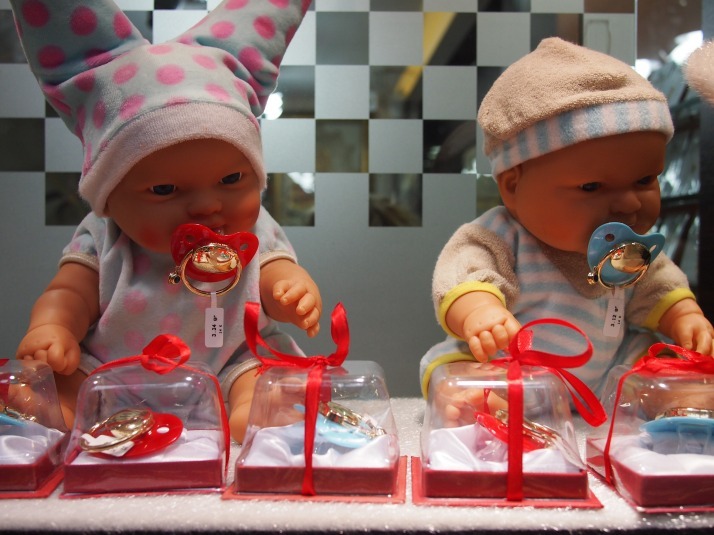 The most surprising sight of the day was seeing gold dummies in a gold shop’s window display! 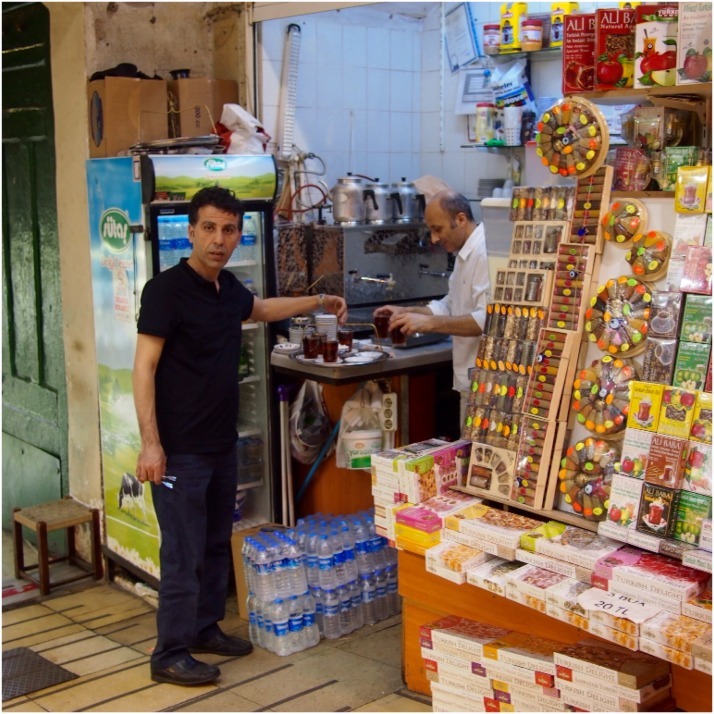 The area running from the Grand Bazaar down the hill to the Galata Bridge is a warren of narrow streets filled with shops. 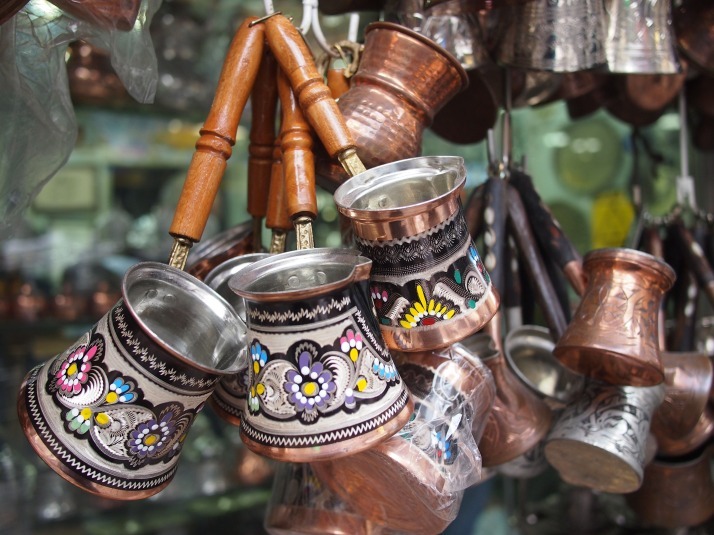 As in the Grand Bazaar (and many other market areas we’ve visited in Asia – Hanoi and Hong Kong to name just two) shops are grouped roughly according to the product they’re selling so we found streets full of underwear and pyjamas followed by streets of cookware and so on. The walking tour directed us into the courtyards of several hans. These are old commercial buildings which were used to store a merchant’s goods and for merchants from distant places to stay in safety, they’re also known as caravanserais. Each han had buildings arranged around one or more courtyards with strong gateways to keep the goods safe. Several of the ones we saw were in a pretty poor state of repair but were often still used for commerce containing either shops or storage. 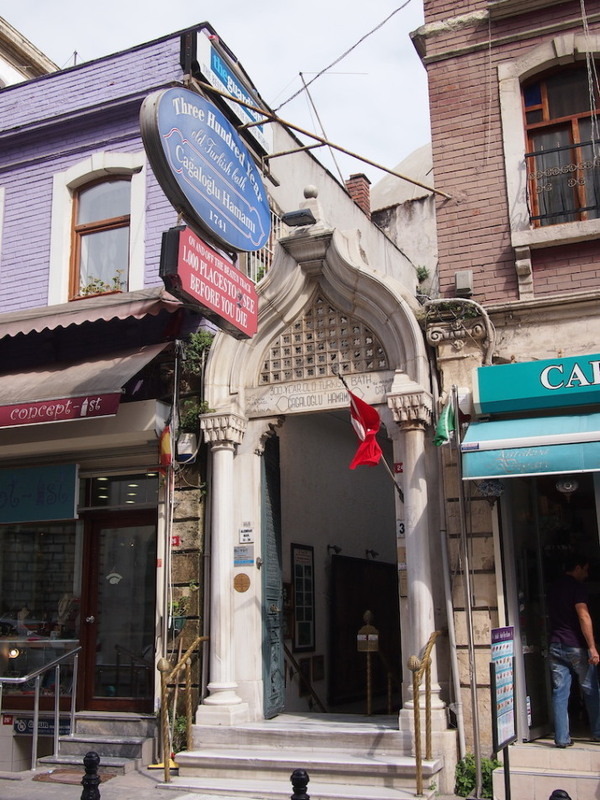 At the edge of the shopping streets is the Rüstem Paşa Mosque. 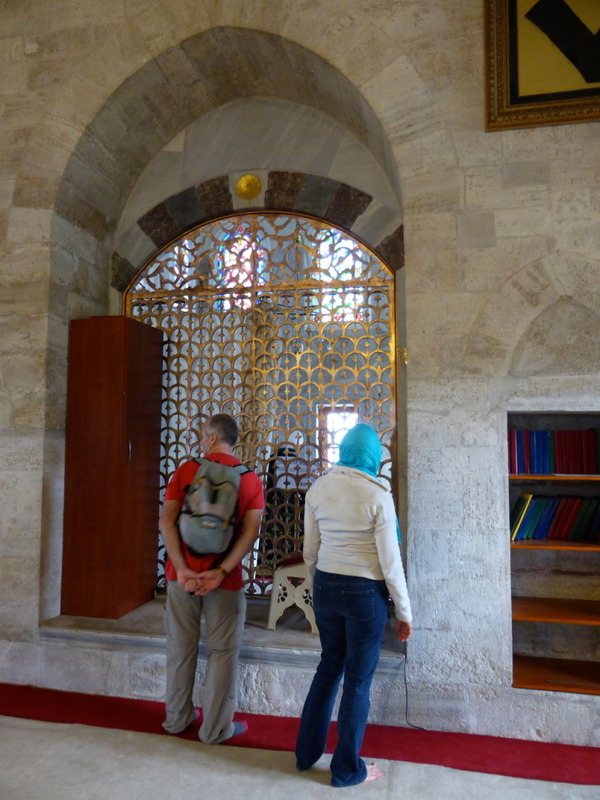 We found the mosque easily enough, but finding a way in was not so straightforward. 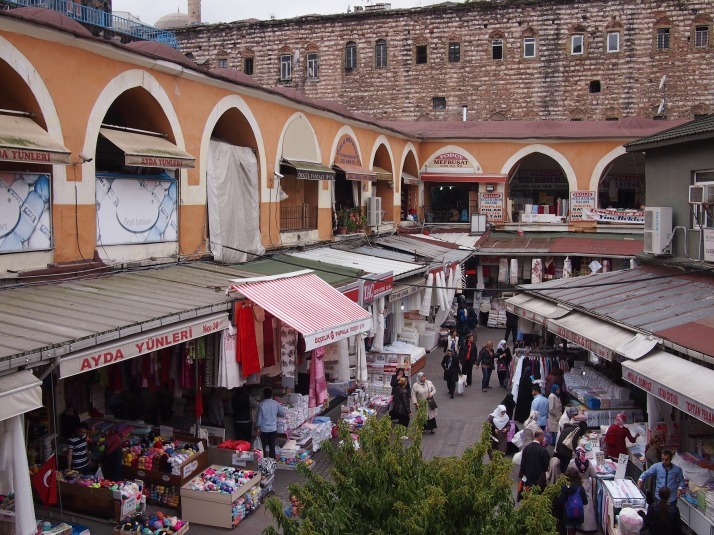 The mosque is built above the shops below and is accessed via two unobtrusive staircases between the merchandise. 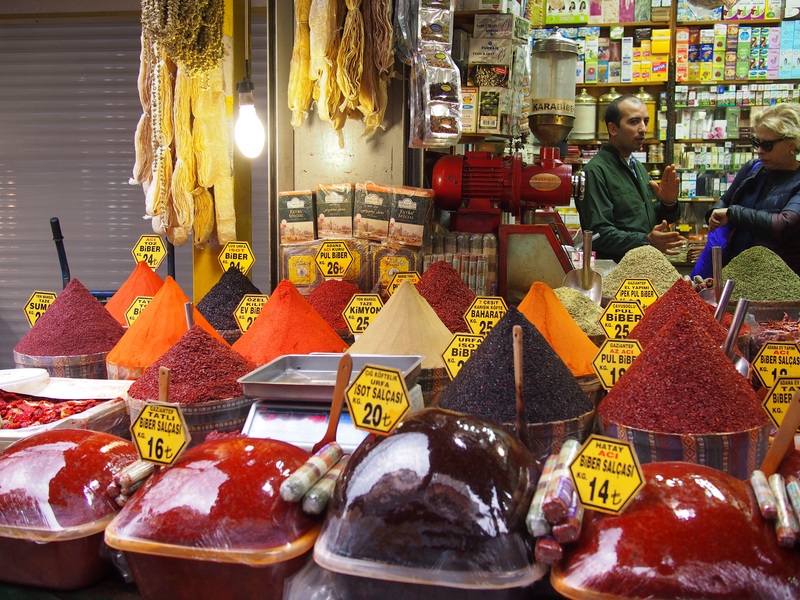 The final stop on our market exploration was the Spice Bazaar. Originally a part of the Yeni Cami mosque complex this market is an L-shaped block of shops selling not only spices, but Turkish Delight (lokum), nuts and dried fruit, along with other fancy foodstuffs as well as a generous sprinkling of souvenirs. 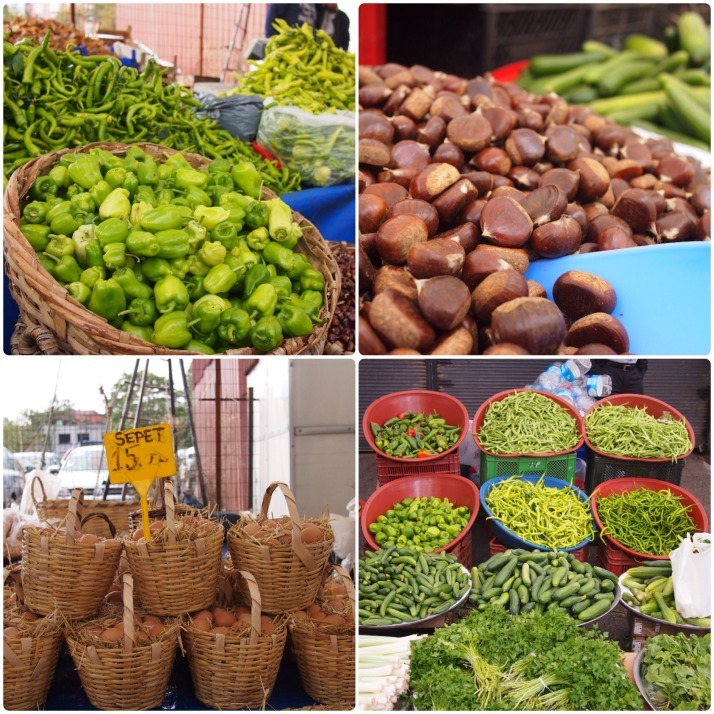 As a complete contrast to the bustling streets and souvenir stalls around the Grand Bazaar, the next day we headed to the Sunday Inebolu farmers market at Kasımpaşa. 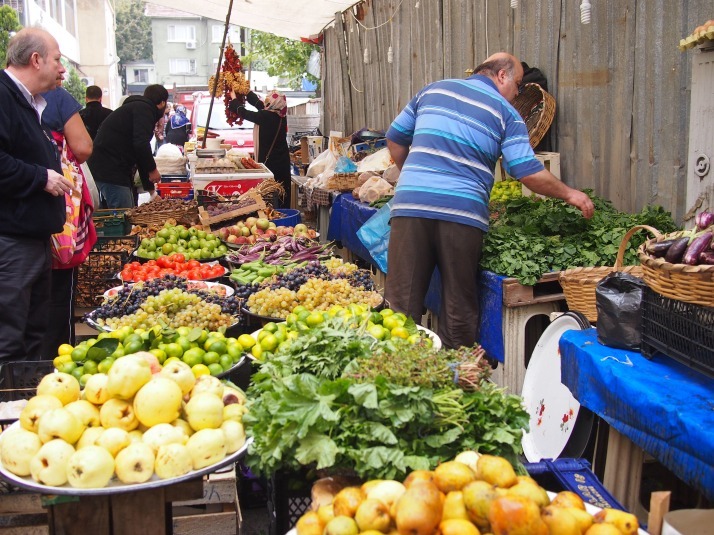 Here we didn’t see any other tourists, just lots of locals stocking up on seasonal fresh vegetables, bread and cheese. 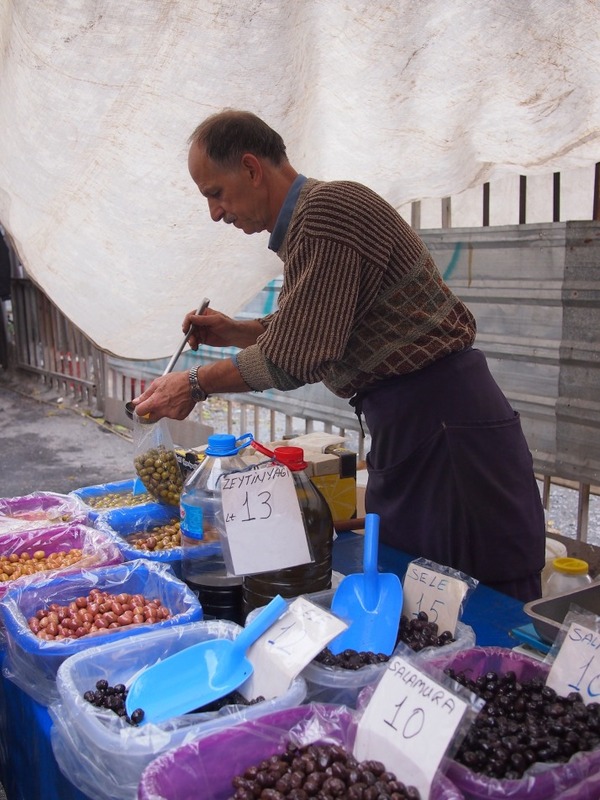 It’s customary to just approach the olive stall and help yourself to a sample from each tub until you find the one that you would like to buy! 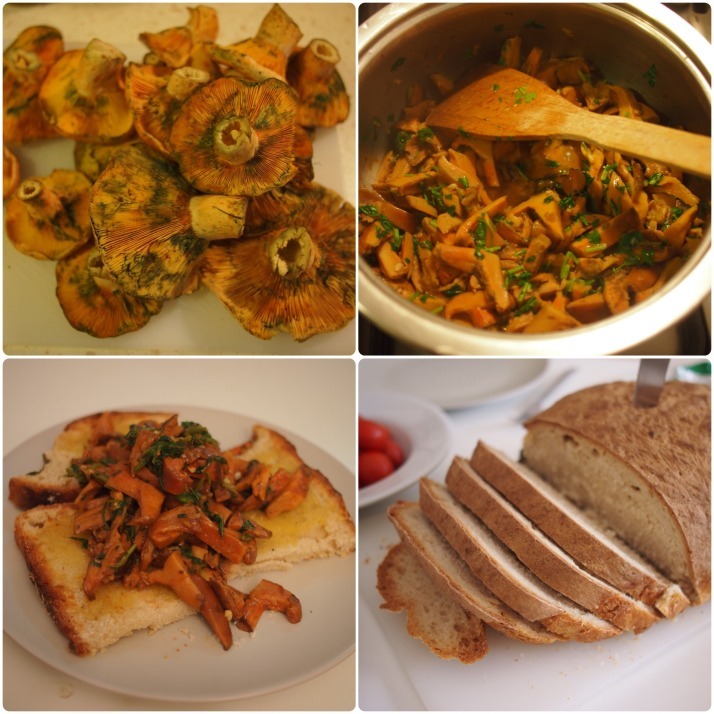 We bought a large bag of the mushrooms and a very dense loaf of bread – what better way to use them up than garlic mushrooms on toast? 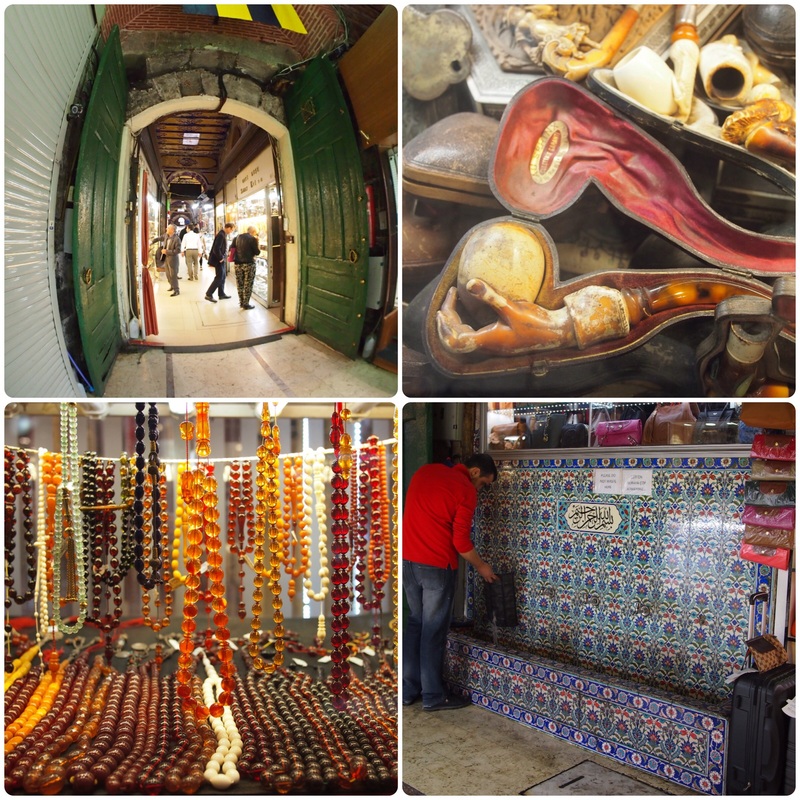 This entry was posted in Places and tagged Istanbul, Market, mosque, Strolling, Turkey on October 27, 2014 by Julie. 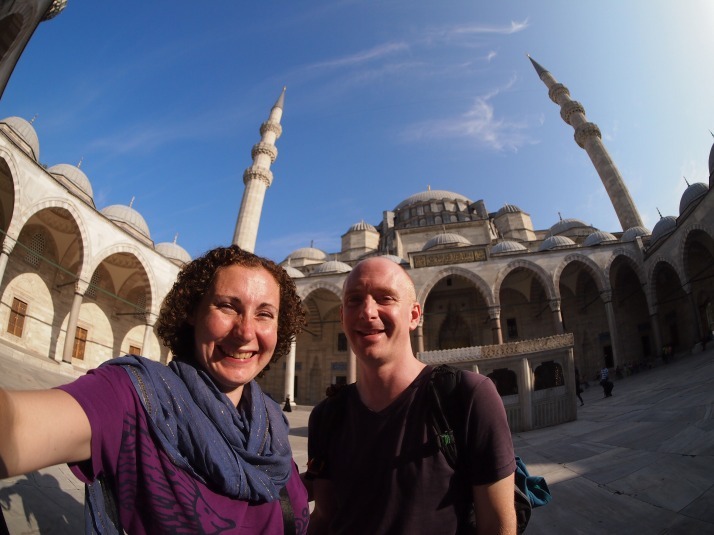 Continuing our strolling explorations through Istanbul, we popped our heads into Sultan Ahmet Camii, known in English as the Blue Mosque, which is also the starting point for the day’s walking trail which took us downhill to the edge of the Marmara Sea (chapter 6, page 107). 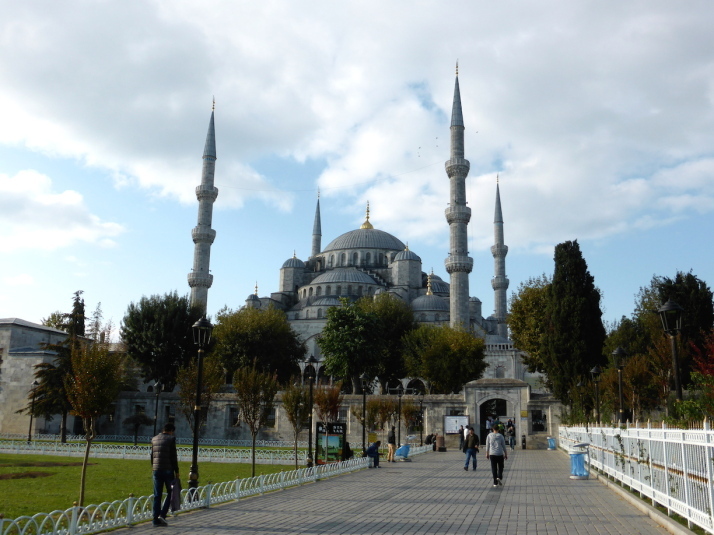 The Sultan Ahmet Camii is the most famous purpose-built mosque in Istanbul. 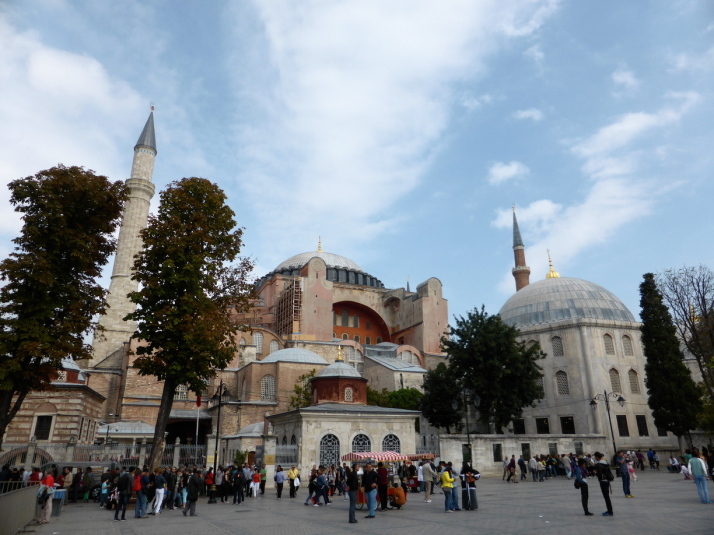 I say it that way because, in a “keeping up with the Joneses” kind of way, it sits next to the larger, grander Hagia Sophia. 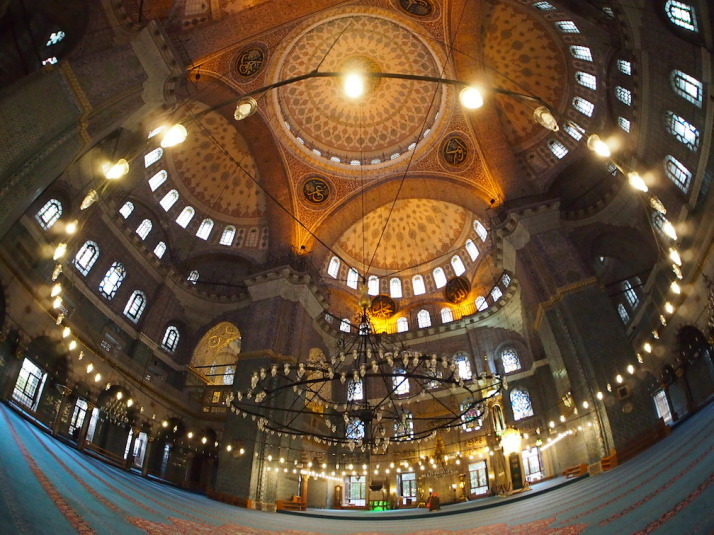 Founded by Sultan Ahmet I, he instructed his architect – a student of the famous Sinan – to build a mosque that surpassed the beauty of Hagia Sophia. There are a few nice tales about its construction.. firstly, the young Sultan was so keen to see it completed that he often pitched in himself; and secondly that when it was unveiled as having 6 minarets rather than 4, Sultan Ahmet was accused of being too self-aggrandising because Mecca was the site of the only other 6-minareted mosque. His solution was to pay for a 7th minaret in Mecca. We got there just after the opening time hoping to beat the inevitable queues from the tour busses as this is Istanbul tourist central. 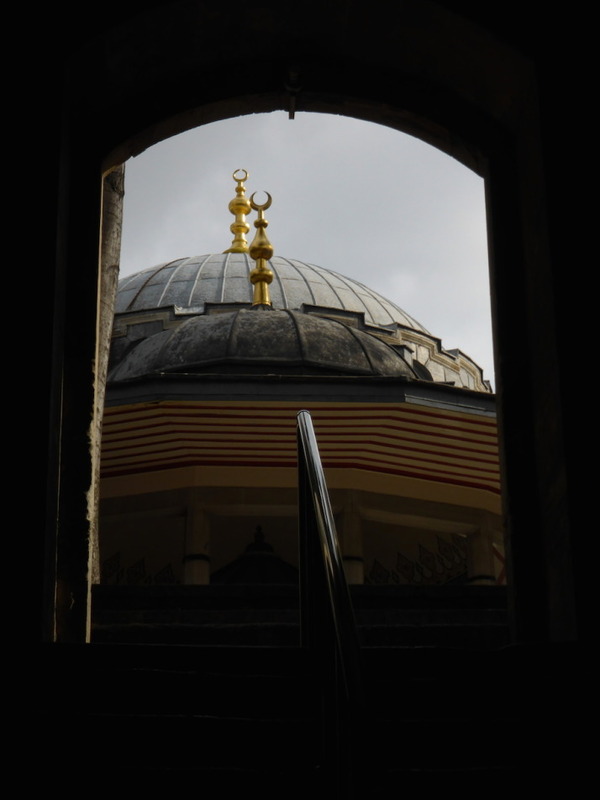 Our timing was perfectly coordinated with said coaches, and from the entrance in the south-west corner the queue stretched the length of the mosque, its courtyard, around the corner and half-way up the other side. We were offered expedited entry with a local tour guide for 40 lira (about £13) but being British we secretly like waiting in line and it only took 35 minutes. Outside, the dark stone of its distinctive silhouette so iconic in Istanbul’s skyline looks fantastically detailed in bright sunlight, but seemed to make it one with the dreary overcast cloudy sky we had. This lowered our expectations for what we were about to find inside.. 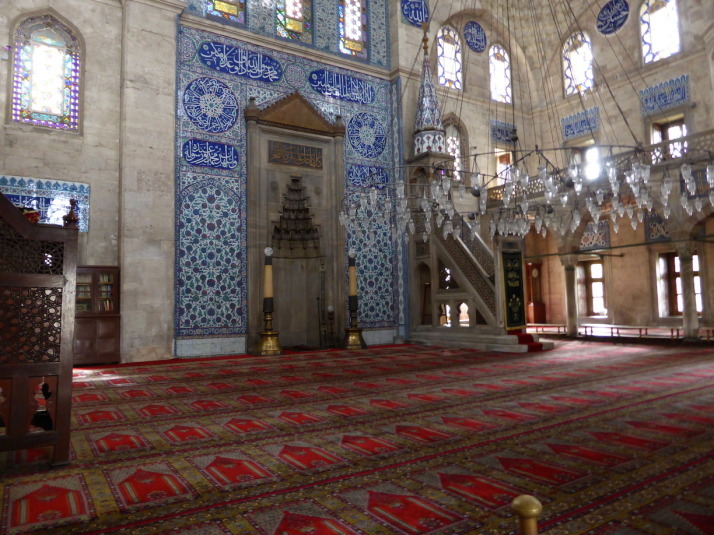 Inside the Sultan Ahmet Camii or Blue Mosque. The colours, light and shapes are almost too much for the senses! The barriers separate the tourists from the worshippers as this is very much a working mosque. 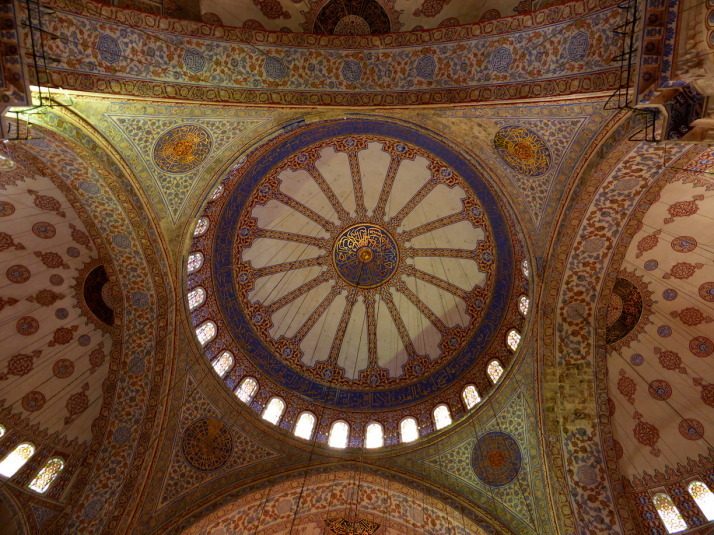 I thought the blue Iznik tiles of the first balcony were the reason for the name ‘Blue Mosque’, but it comes from the main dome.. Despite being restricted to the back 3rd of the main prayer hall, this, like so many times in Uzbekistan, was a “wow” moment. The space is huge, and dominated by the giant red carpet on the floor and the massive, beautifully decorated dome overhead. 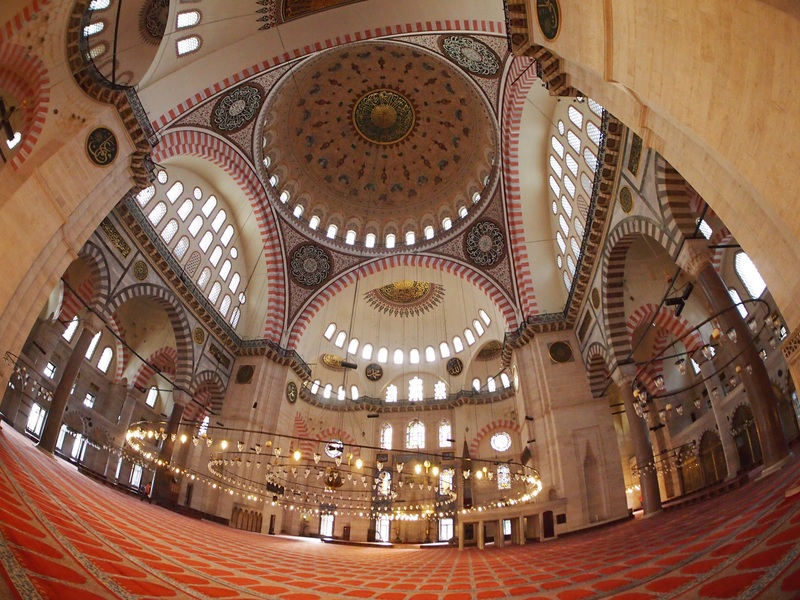 It’s the blue in the dome’s design that gives the mosque its name. 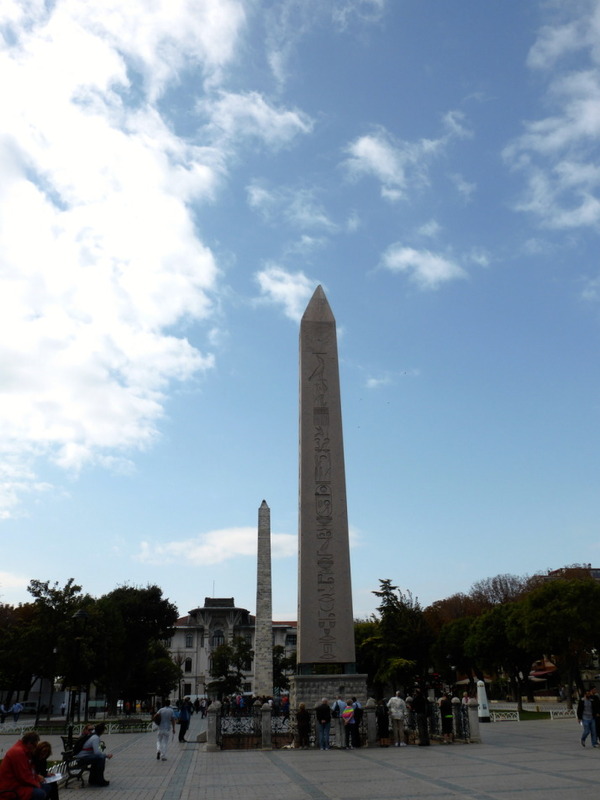 Just outside the Blue Mosque we stopped for an early packed lunch next to the massive Egyptian obelisk while we read the introduction to the Hippodrome from our guidebook. Now a narrow park, it was really difficult to appreciate the sheer scale of the once mighty Hippodrome. Even when we read that the courtyard of the Blue Mosque was built on the foundations of the Hippodrome’s seating, we still weren’t able to fully appreciate how big and important this arena was to Byzantine society. 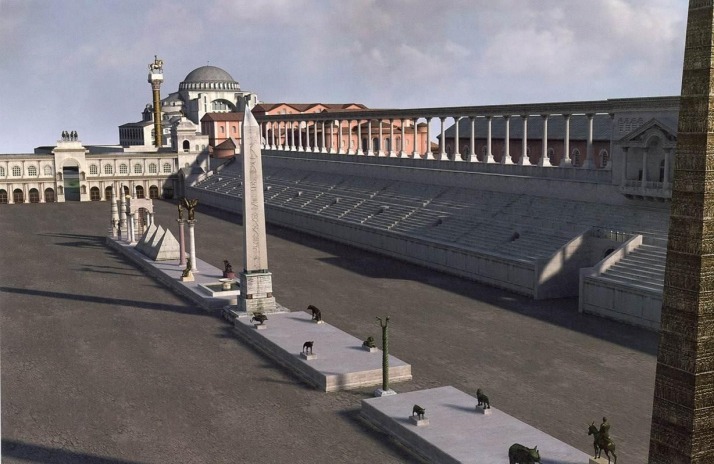 In researching this post, I found this reconstructed image..
All that remains of the Hippodrome today are a fountain, 3 central columns, and the foundations of the western rounded end. The largest of the central columns is called, appropriately, Colossus, and having stood next to it in person, to then see it in situ as the middle-marker of the 30,000 seat capacity of the Hippodrome finally gave us a sense of scale. 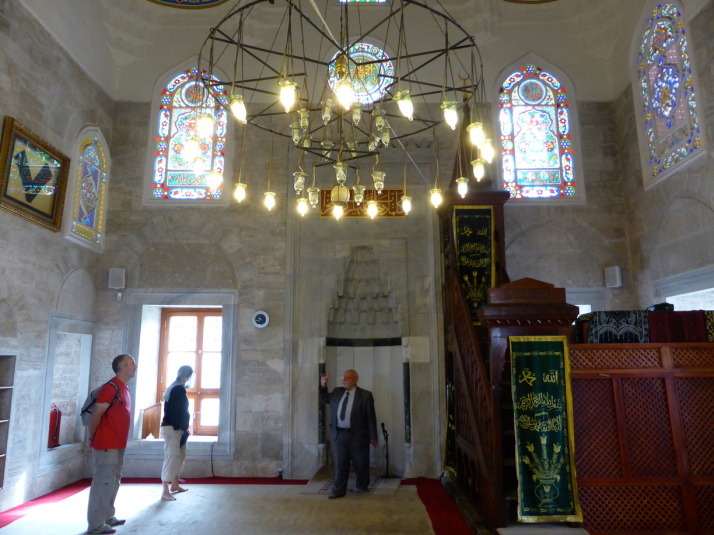 Skipping a few of the smaller sights on the route, we arrived at another of Sinan’s mosques, Sokullu Mehmet Paşa. Built in 1571-2 on the site of a former church, we entered through a long outdoor corridor into the serenity of an empty courtyard and an all but empty mosque – a far cry from the bustle of the Blue Mosque earlier! 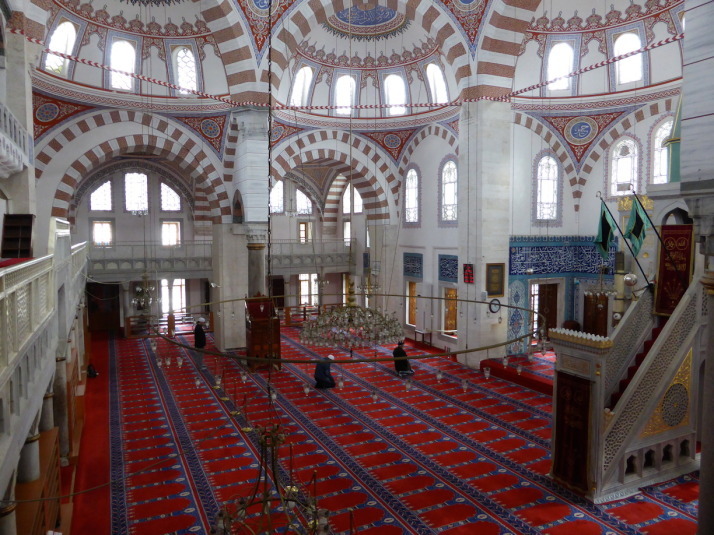 Namazgah of Esma Sultan. Nice, but what’s it for? At first glance we weren’t sure we’d found what we were looking for when we entered a small park and children’s play area and spotted an old stone square fenced off in the corner. 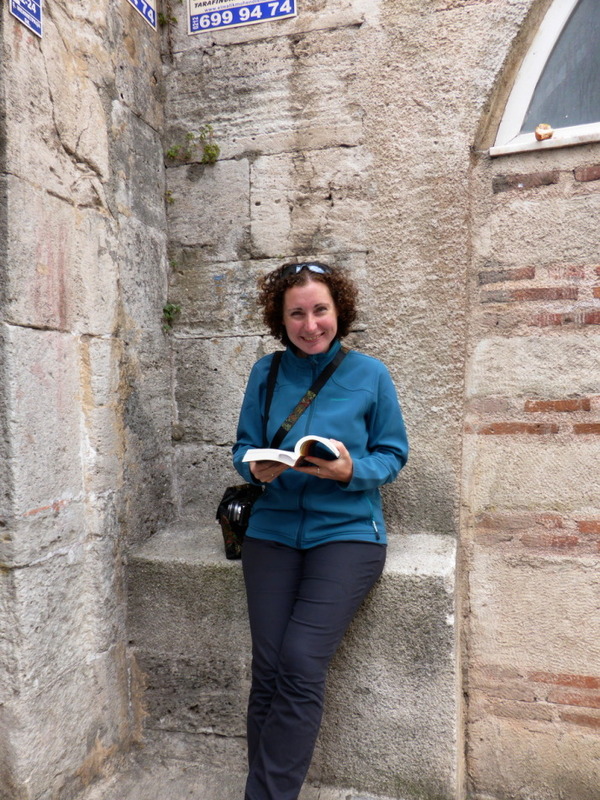 On closer inspection it was, as our book describes, the last remaining namazgah within the city walls, and one of 3 left in Istanbul. So what is it? 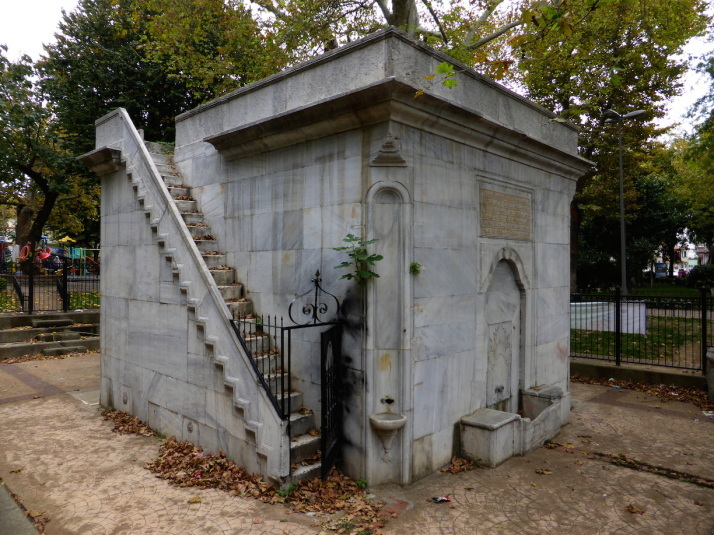 Well, a namazgah is an outdoor prayer area. We thought it was a really interesting thing to see, and it was a shame we couldn’t get closer than the surrounding fence. 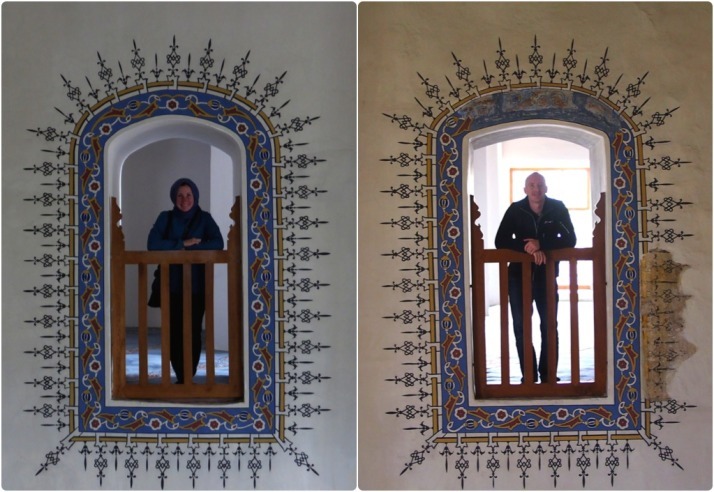 Just like Sokullu Mehmet Paşa earlier, we found SS Sergius & Bacchus to be quiet, and we were encouraged to do something we’ve wanted to do in every mosque we’ve visited with an internal balcony – go upstairs! The late afternoon light through the windows was lovely, we loved the light airiness of the decoration and the luxurious sky-blue carpet which felt decadent to walk on. The route then ducks under the railway lines which once carried the Orient Express, and through the old sea wall defences to highlight some of the oldest parts of the city. 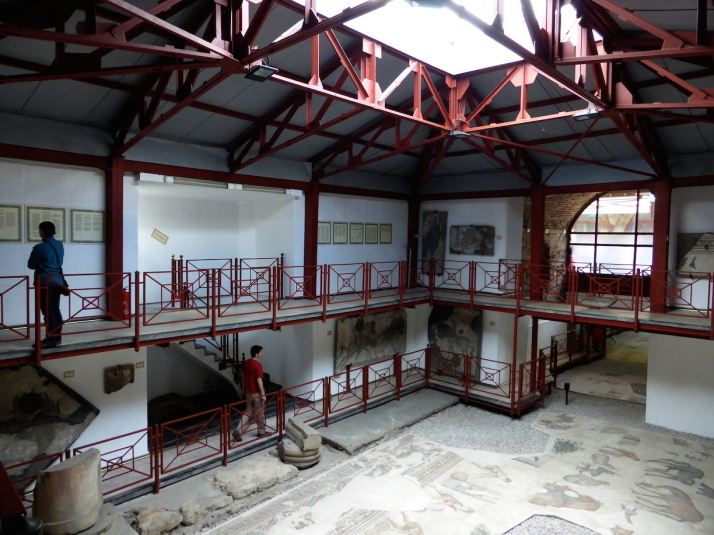 The highlight of this section for us was the huge marble window frames of the Palace of Bucoleon, which was part of the original Grand Palace of Byzantium, once the heart of Constantinople, and sadly all that remains of it above ground. Even though little of this palace remains, it gave us a sense of scale and grandeur. 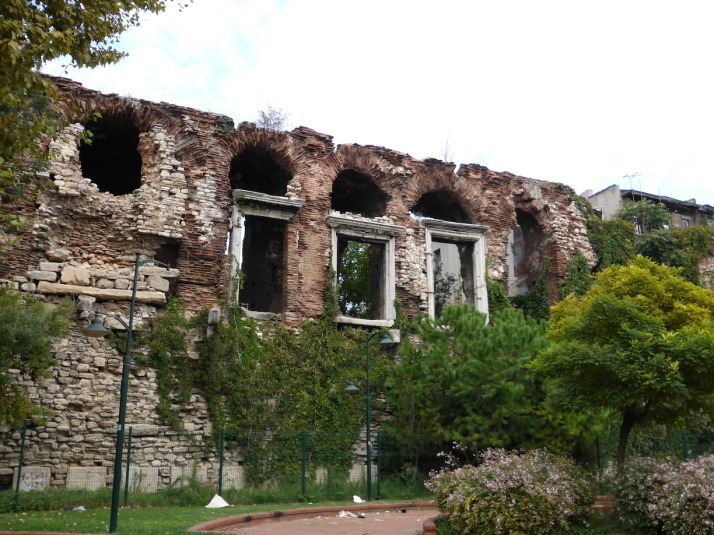 After the Palace, we passed ruins of old gates into the city, a marble pavilion and the foundations of an old church. A lot of the old vaulted sub-structures and gatehouses are being used for temporary shelter, and while we felt perfectly safe wandering along the sea walls, the smell of impromptu toilets did prevent us from inspecting some of the vaults more closely. 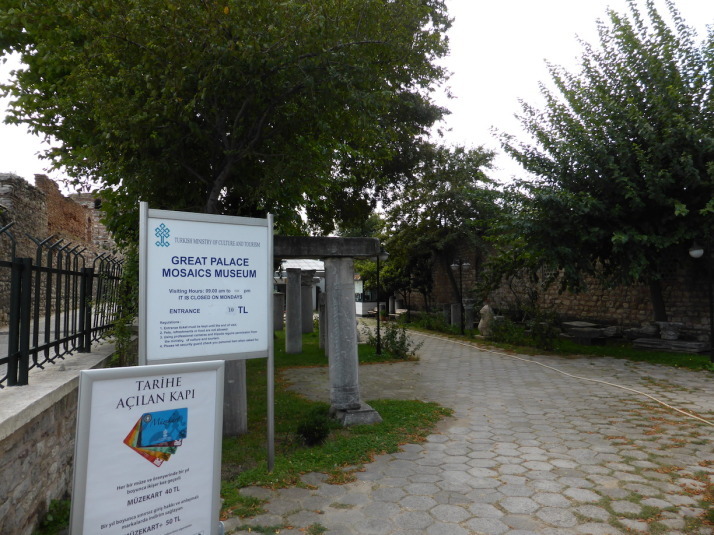 The entrance to the Grand Palace Mosaic Museum behind the Blue Mosque, not a mosaic in sight.. yet.. 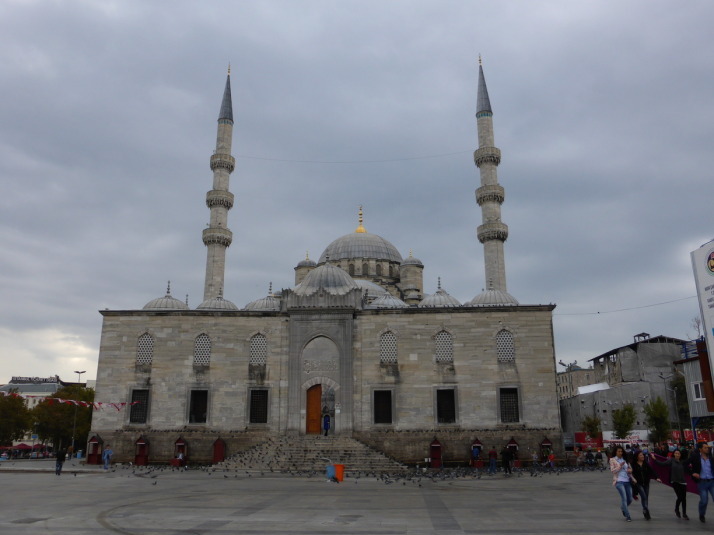 The walk ended just behind the Blue Mosque at the Mosaic Museum, which doesn’t look much from the outside but it’s mentioned briefly in our guidebook, and the reviews we’d read elsewhere highly recommended it. The first room of the Great Palace Mosaic Museum. We weren’t expecting so many mosaics! After passing an unkempt garden of old stone columns and capitals, we entered what looked like a temporary shed and found ourselves on a 1st floor catwalk overlooking the restored mosaic peristyle of the Grand Palace. 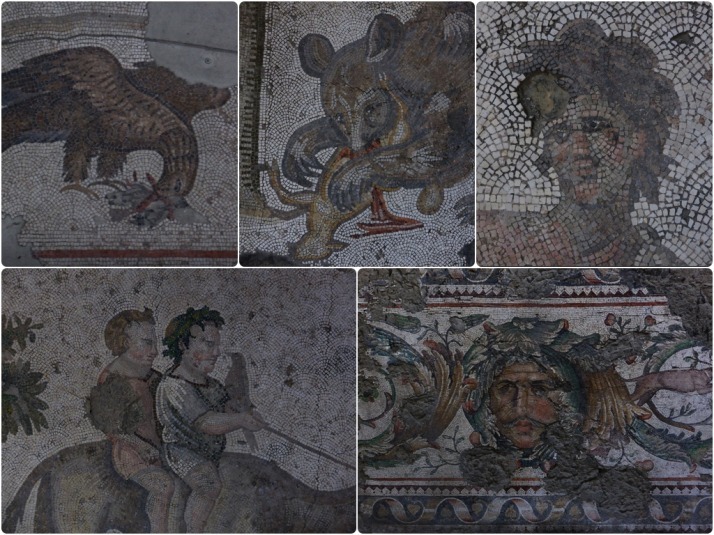 Thought to date from Justinian’s reign (527-65), and believed to be the floor of the north-east portico of the Grand Palace, the mosaics were uncovered during excavations in 1935 and have since been restored a couple of times. 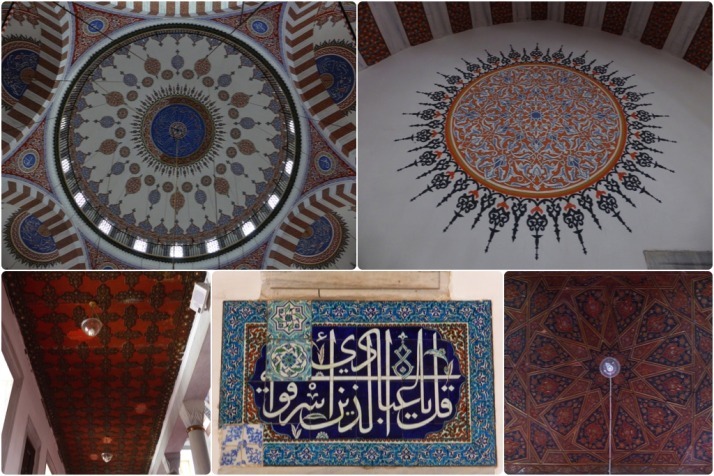 The mosaics are wonderful – we weren’t expecting such detailed work or such an extensive collection. The most recent restoration effort is explained in fascinating detail along with what is known about their history in panels throughout. It was a nice end to another day of strolling, and something quite different to mosques and old walls. 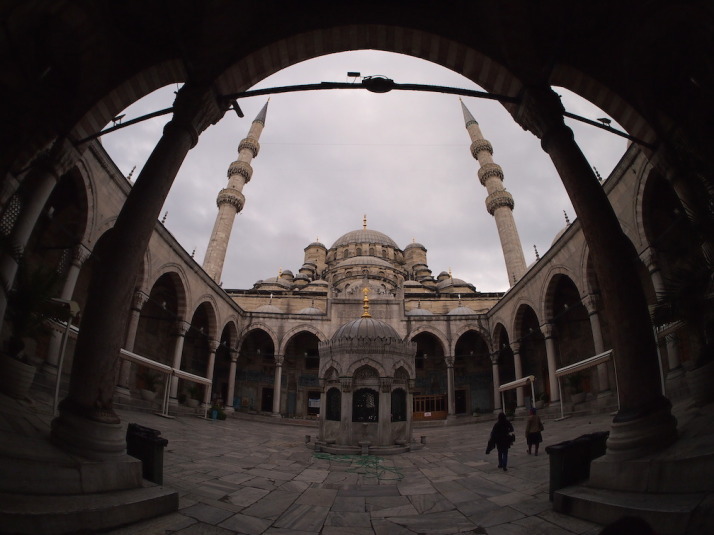 This entry was posted in Experiences, Places and tagged Istanbul, mosque, Museum, Strolling, Turkey on October 25, 2014 by Andrew. 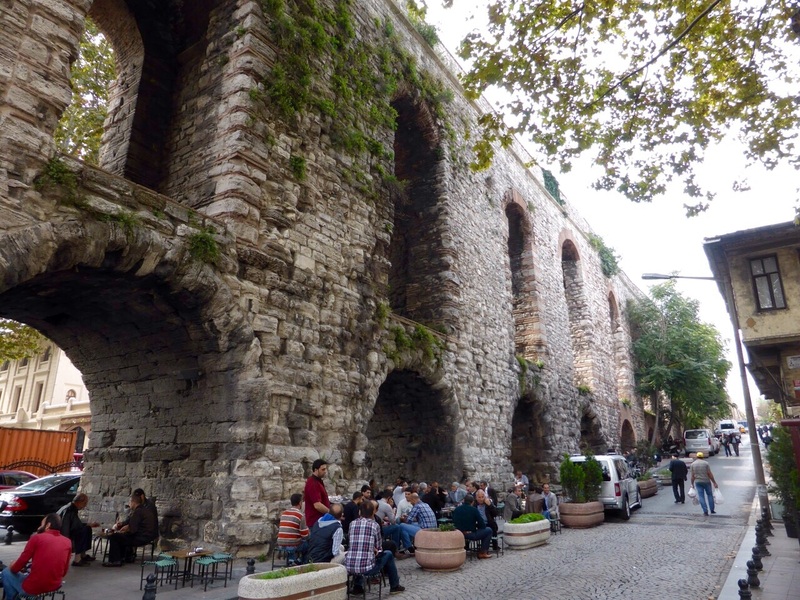 We really enjoyed the first ‘stroll’ that we did in Istanbul so for our second one we chose to head a little off Istanbul’s beaten tourist path towards the Şehzadebaşı district. 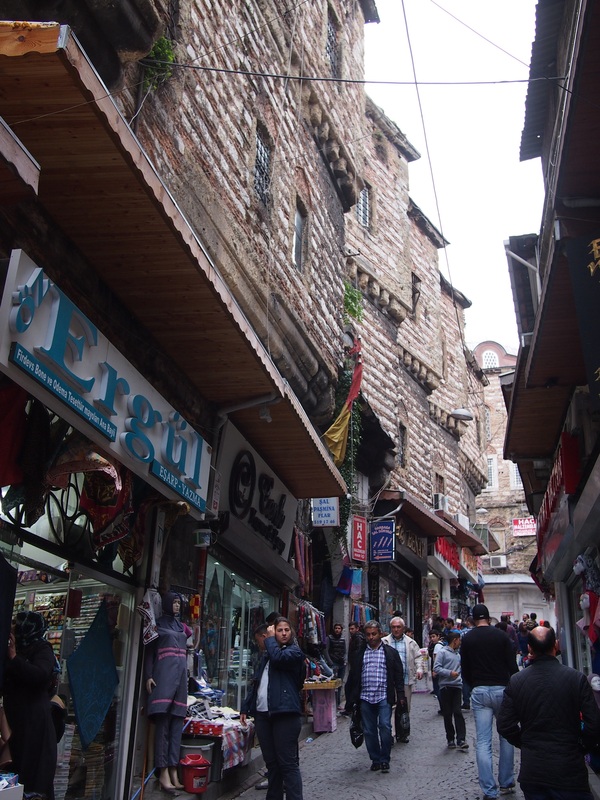 We again began at the Galata Bridge but, rather than walking towards the tour group crowded square in front of the Haghia Sophia, this walk went in the opposite direction to areas where people live and go about their daily business without thinking about tourists. 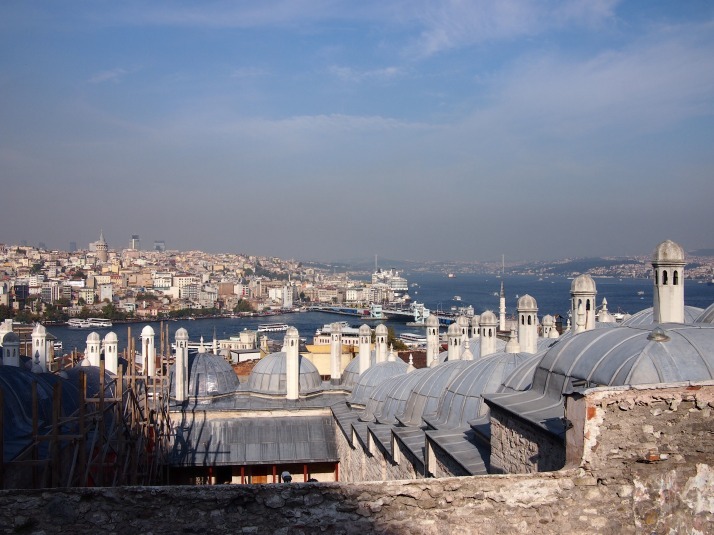 Although it doesn’t incorporate any “big sights” this walk gave us a real appreciation for how steeped in history Istanbul is. It took us past many small mosques and other buildings, many over 500 years old, tucked away in commercial and residential areas and still in use today. Probably the most impressive sight on this stroll is the former Church of the Pantocrator. Unfortunately for us it is undergoing what appears to be extensive restoration so we weren’t able to explore it fully. 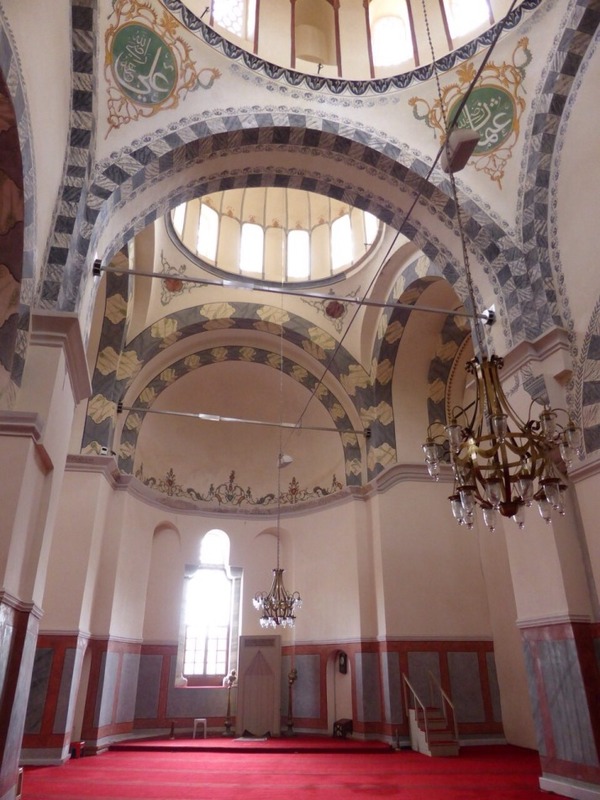 It was built between 1120-36 during the Byzantine (Roman) period when Istanbul was called Constantinople (there’s a song in there somewhere…) and is actually two churches joined by a chapel. 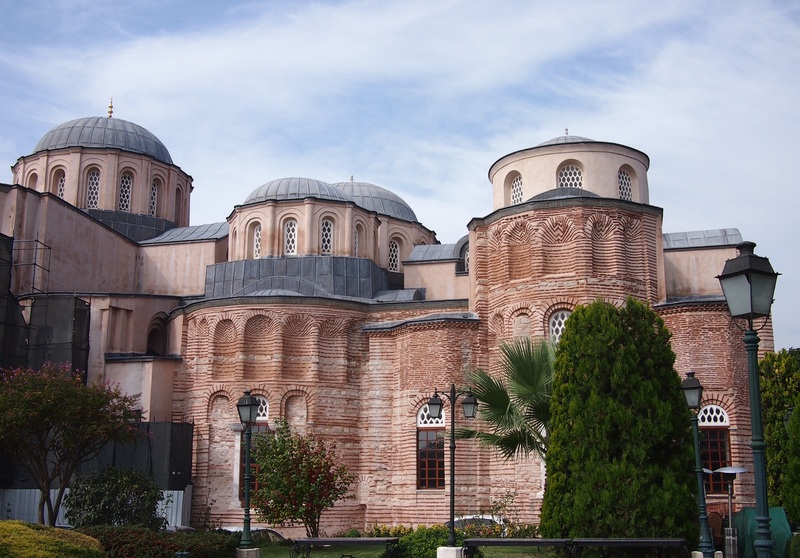 Due to the builders’ fencing we could only really get a good look at the southern church which, as with many of the Byzantine churches, was converted to a mosque when the Ottomans took the city in the 15th century. It isn’t currently open to the public but we managed to sneak in along with some people who had an appointment with the imam! Inside it was strange to see the mihrab not in the centre of the wall opposite the door (as it is in purpose built mosques) but set off to an angle on one side. 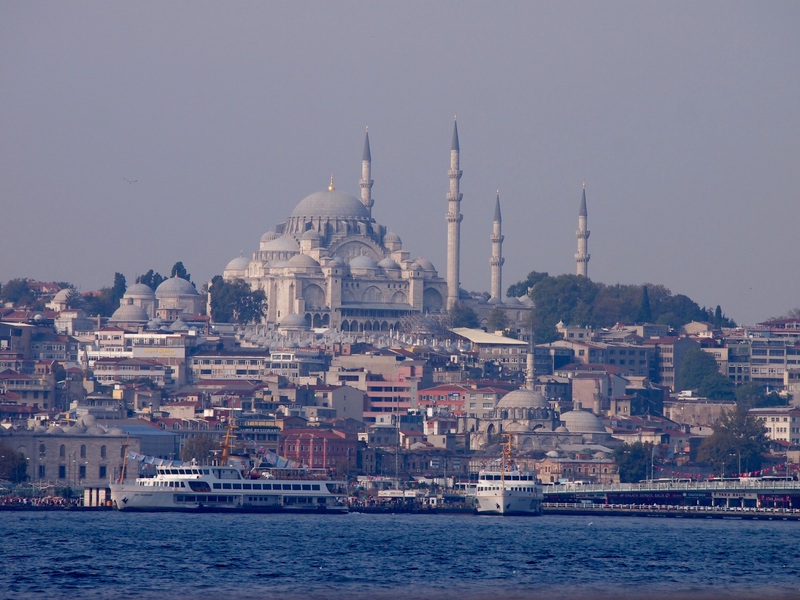 This is because the Byzantine churches were oriented to the east but mosques in Istanbul face towards the south-east, the direction of Mecca. Trying to find the next sight on the itinerary, we were hailed by a man working in a bakery. 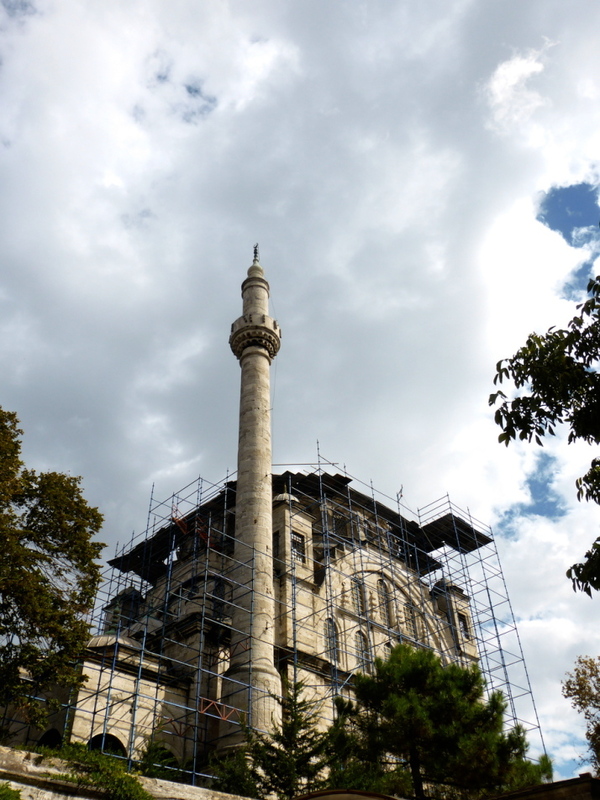 We said hello and carried on our way but quickly discovered the Şeyh Süleyman Mescidi covered in scaffolding (the authorities here are really in restoration mode) so we retraced our steps for a bite of lunch. 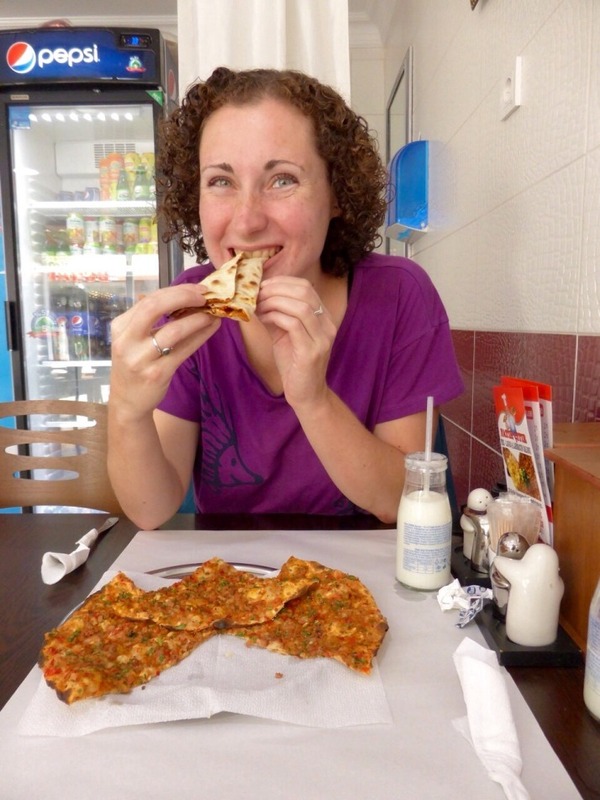 We were the only customers eating in but there was a steady flow of takeaway business and as the friendly waiter took our order (part guesswork on our part and part his recommendation) we settled back to watch it being made and baked in the wood fired oven behind the counter. It doesn’t take a genius to work out that local style food from a busy shop, freshly prepared and still hot from the oven was absolutely fantastic! Having slightly over-ordered (and hence overeaten) we shambled into the back streets beyond the shop to search out yet more historic mosques. This felt even more off the beaten path. We found locals gossiping on the streets, old men drinking tea and reading newspapers, and kids running up and down with cap guns more than once scaring us with a nearby bang. We got a little lost but eventually managed to reorient ourselves and carry on with the stroll. 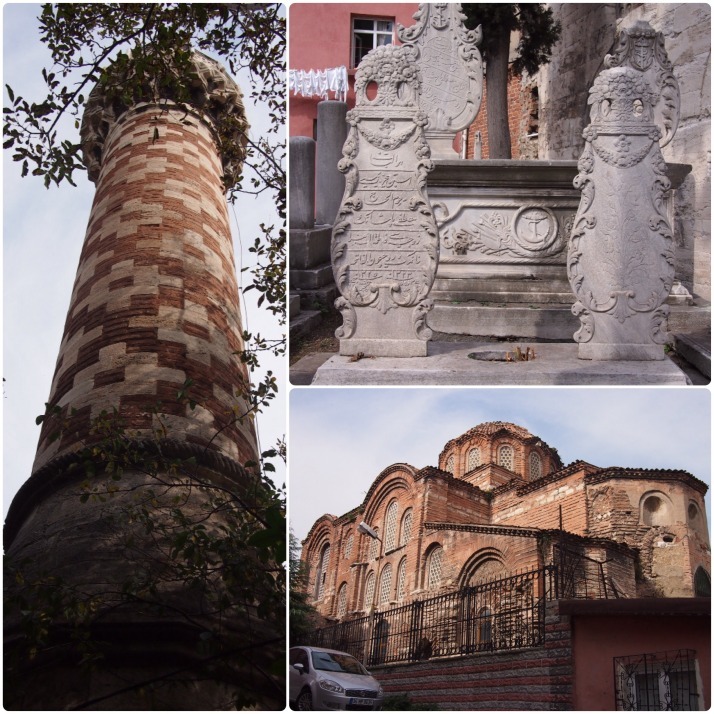 Retracing our steps back past the Church of the Pantocrator we turned, as instructed, down Itfaiye Street where we were expecting to find a hamam, built by Istanbul’s most famous Ottoman architect, Sinan, and recently reopened. We suspect that this was the building completely covered in scaffolding (yet more restoration) but we were too distracted by the pens full of sheep and goats to investigate more closely. 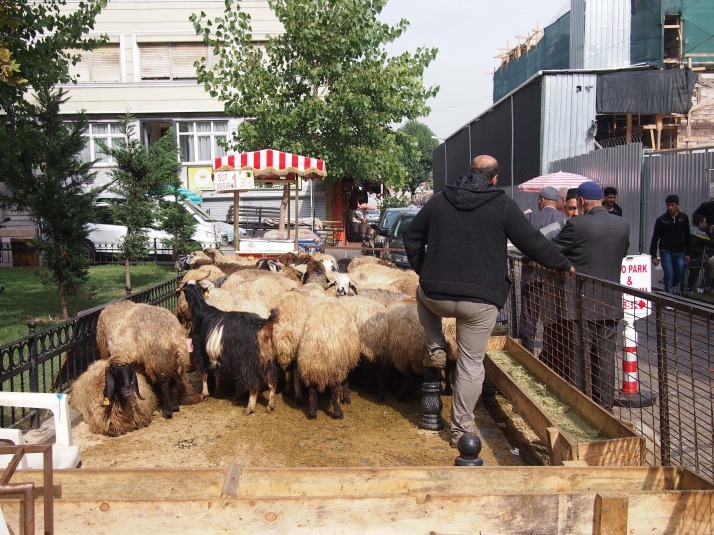 It looked more like a livestock market than a butcher’s shop but, as we watched, sheep were sold and then hustled over to the shops across the way where they were slaughtered and butchered. It reminded us of the goat slaughter we witnessed in Mongolia. Having escaped without a carcass we made our way to the end of the street where we found the hugely impressive Aqueduct of Valens. This structure was built around AD 375 as part of a system to bring water into the city. Incredibly 900m of the original one kilometre length remains. It seems to pass right through local life unnoticed, crossing a busy road, sheltering teashops and bordering a public park. Apart from the archaeological remains of another ancient church, this was the end of the stroll. As we had a couple of hours of the afternoon left we decided to head up one of Istanbul’s many hills to visit the Süleymaniye Mosque. 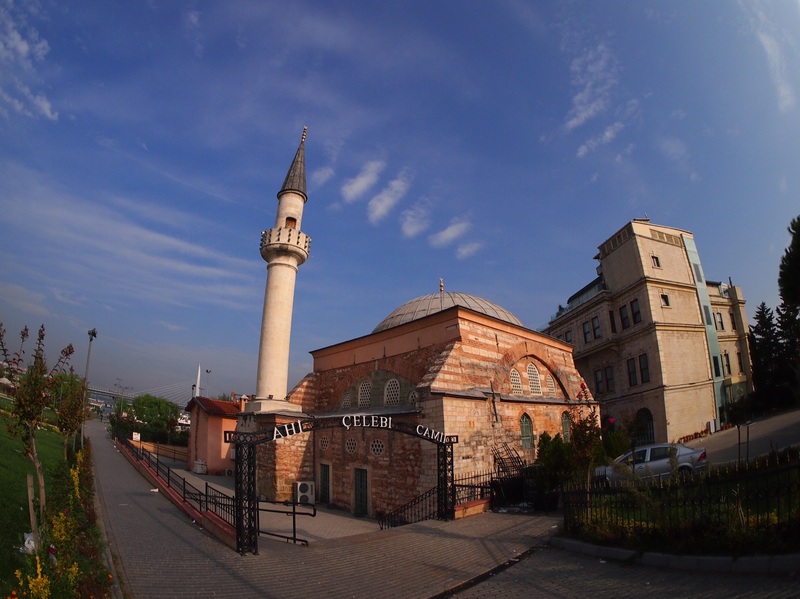 This mosque was commissioned by, and is named after, Süleyman the Magnificent, Ottoman Sultan from 1520-66. Its architect was Mimar Sinan, regarded as the greatest of the Ottoman architects. 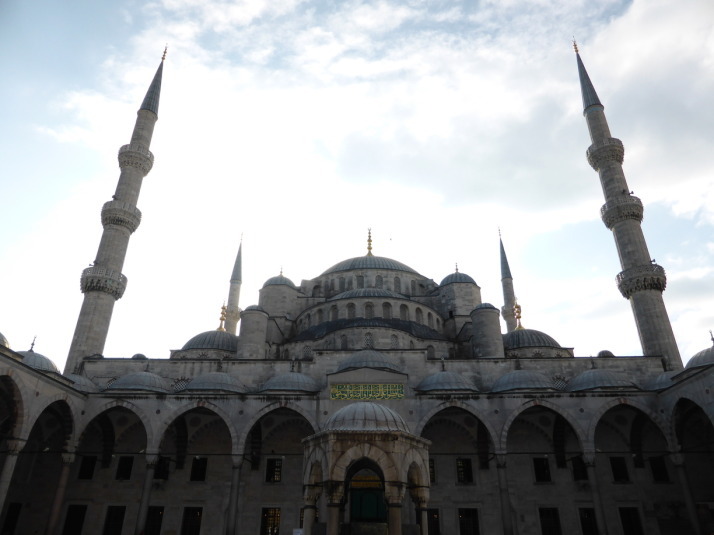 This is the largest building that he constructed and our guidebook assures us that the Süleymaniye Mosque is “by far the finest and most magnificent of the imperial mosque complexes in the city”. The exterior is extremely beautiful, both in general form with its multitude of domes and the four tall and graceful minarets, but also in the details. We especially liked the arches made up of alternating marble stripes, but everywhere there was intricate stone carving and attention to detail. The inside is just as imposing, it’s essentially one huge open space with the central dome soaring to 47m above the floor. 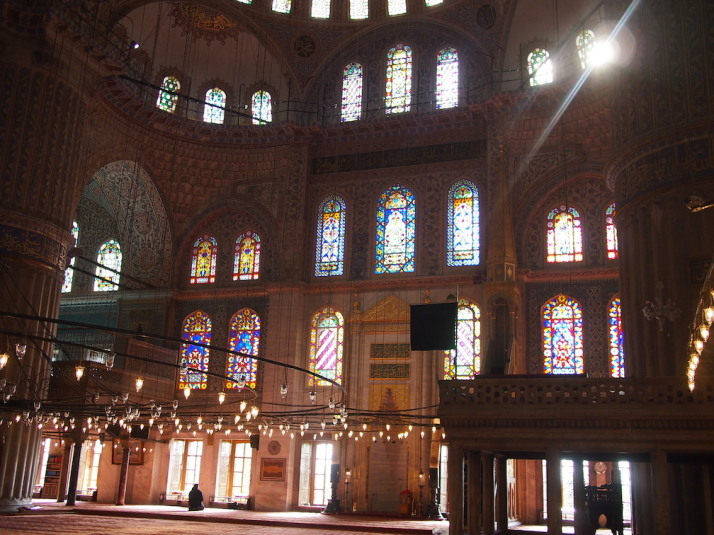 I really liked the painting on the dome, the stained glass windows in the eastern wall and the huge metal circles of lights suspended around the room for illumination and which seem to be typical of all the mosques we’ve visited in Istanbul. 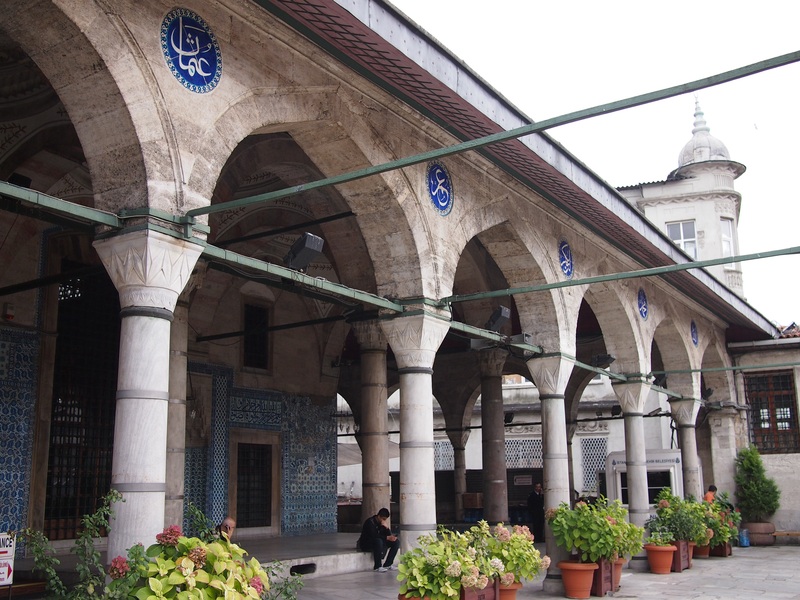 The mosque is at the centre of a complex of buildings which were all part of the same religious foundation. 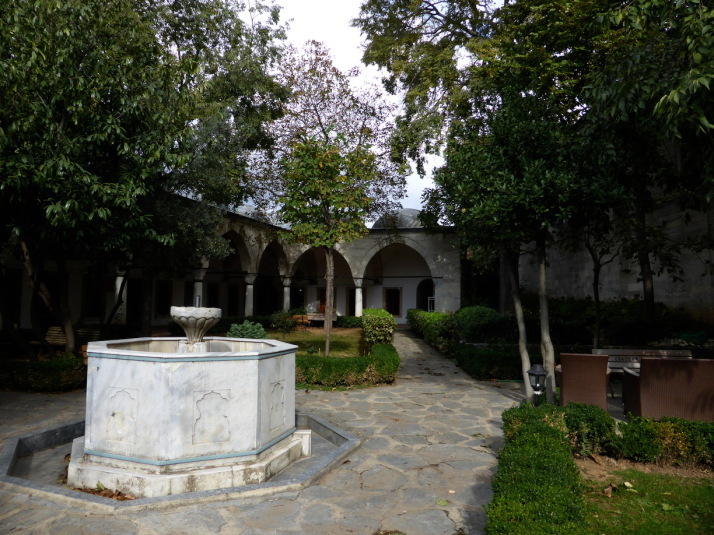 These include theological colleges, a hospital and a hamam. For us one of the most interesting areas of the mosque complex was the graveyard. 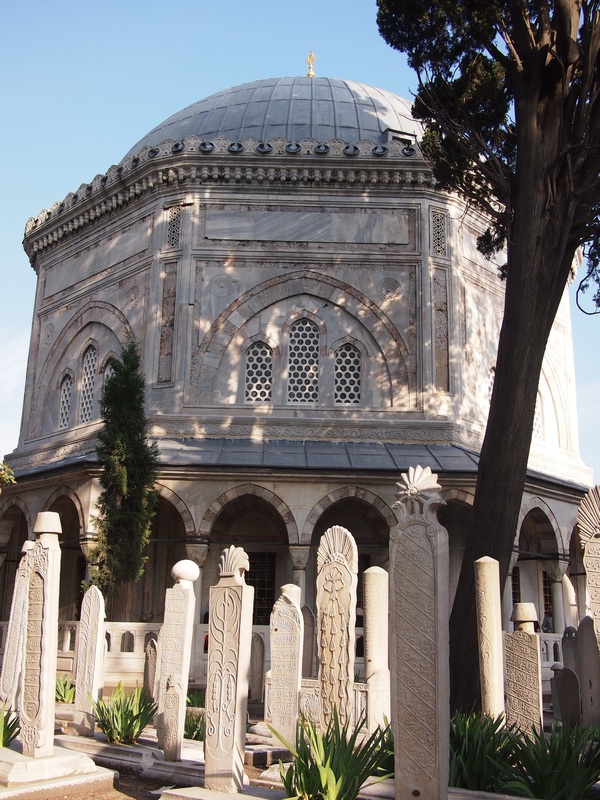 Including the türbes, or mausoleums, of Süleyman himself as well as his favourite wife, Haseki Hürrem. Known in the west as Roxelana she is judged by many to have had too much influence over her husband the Sultan. 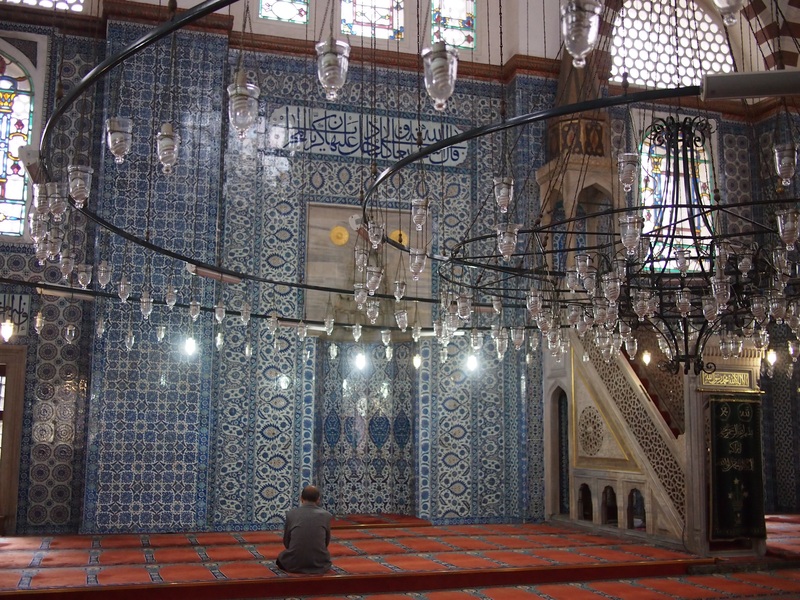 By pressing our noses up against the windows, we discovered that the türbes are beautifully decorated inside with stained glass and blue patterned tiles. 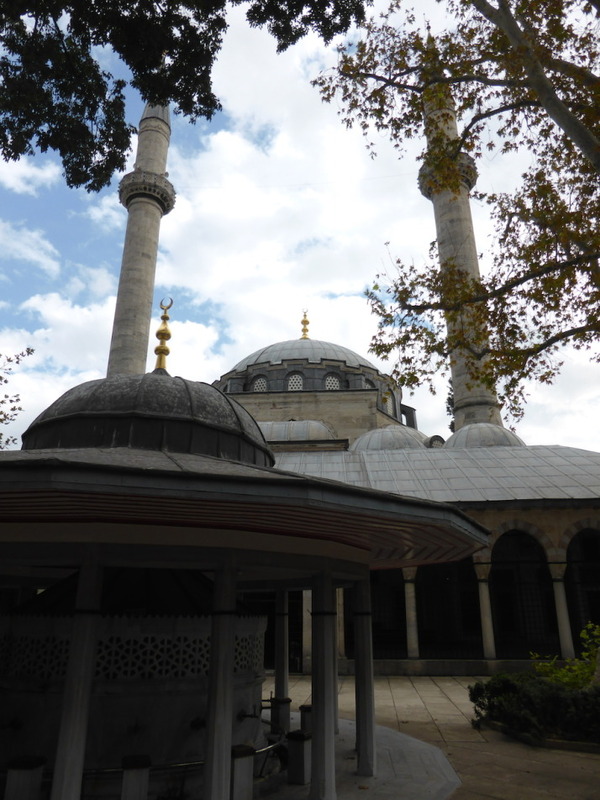 Sinan himself is buried on a corner to the northwest of the mosque in a mausoleum which he designed and built in the garden of what was his home. This entry was posted in Places and tagged Istanbul, mosque, Strolling, Turkey on October 22, 2014 by Julie. From Uzbekistan we flew over the Caspian Sea and further along the old Silk Road to Istanbul, the one-time capital but still the largest city in Turkey, and also the 6th most populous city in the world. Just like Yekaterinberg in Russia, Istanbul sits on the border between Asia and Europe, but we’re not quite back in Europe yet as we elected, at least at first, to stay on the Asian side of the city. 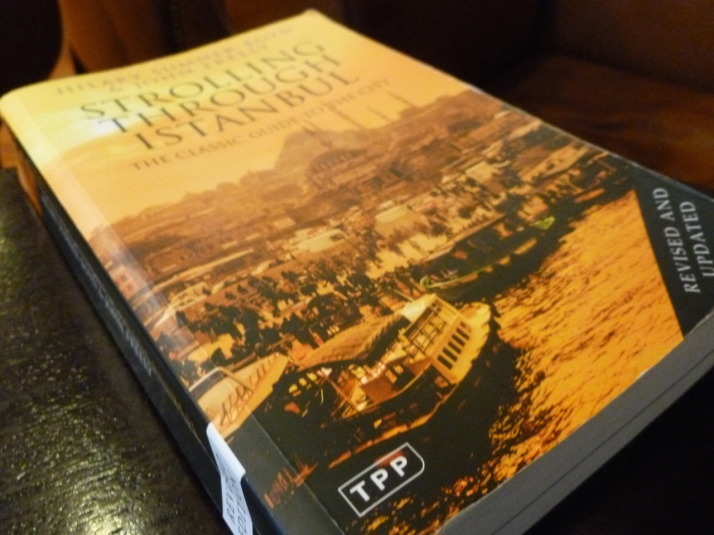 Having spent the last 3 months in 3 different countries (South Korea, China and Uzbekistan), we intend to slow down our travel a little bit, and Julie found the perfect guidebook companion – the delightfully titled “Strolling Through Istanbul“. This isn’t going to be a book review, nor do we intend to reproduce the strolls verbatim, instead we will highlight our favourite sights and experiences from each of the walks we do. The first of the strolls we chose from the book was a half-day, uphill amble from Galata Bridge to Haghia Sophia (chapter 2, page 17 for those following along at home). Conveniently, the passenger ferry from our base in Kadikoy on the Asian side dropped us off in Europe at Eminonu, our starting point. 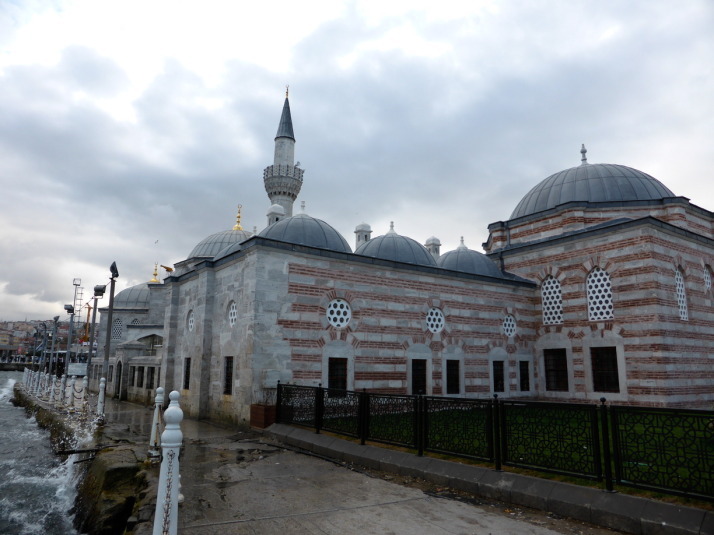 The first stop was also the first mosque we’ve visited in Turkey – Yeni Cami (pronounced “Jami”), literally “New Mosque”. 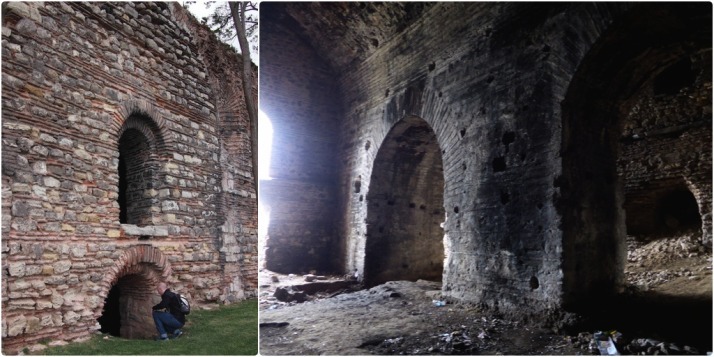 Originally commissioned in 1597 by the then Valide Sultan (Queen Mother of the Sultan), it was to be besieged by her son’s death, and later fire, then lay derelict until it caught the eye of another Valide Sultan and was finally completed in 1663. On a grey day, the exterior, though intricate upon close inspection, otherwise blended into the greyness, but we found the interior was anything but grey..
Our guidebook wasn’t very taken with the interior of the mosque (“the interior is somewhat disappointing”), however we really liked it – the bright blue tiles of differing patterns that decorate the four main supporting pillars were vibrant, and also completely cover the main focal point of the mosque – the south-east facing wall with the mihrab which indicates the direction of Mecca. 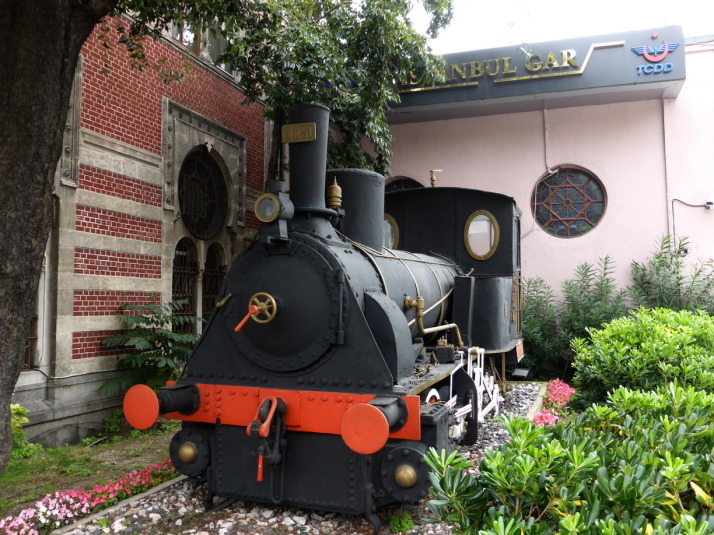 An old engine on display outside Sirkeci Station – the terminus of the Orient Express service. I doubt this engine was used as it’s a bit small..
Sirkeci train station gets a passing mention on the route, but given our love of overnight train journeys we were pleased to learn that this station was the terminus for the Orient Express! Sadly, the Orient Express stopped running on the 13th of December 2009 so we’ll have to find another way back to Blighty..
Further up the hill we arrived at another institution of Turkish life – the hamam or public bath. 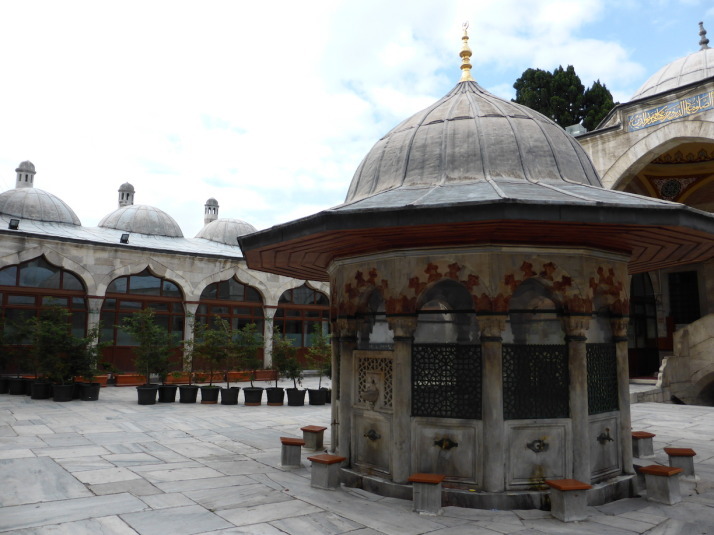 Our guidebook helpfully notes two things: the Turkish bath is a direct descendent of the Roman bath; and this particular hamam is probably the most beautiful and famous in Istanbul. 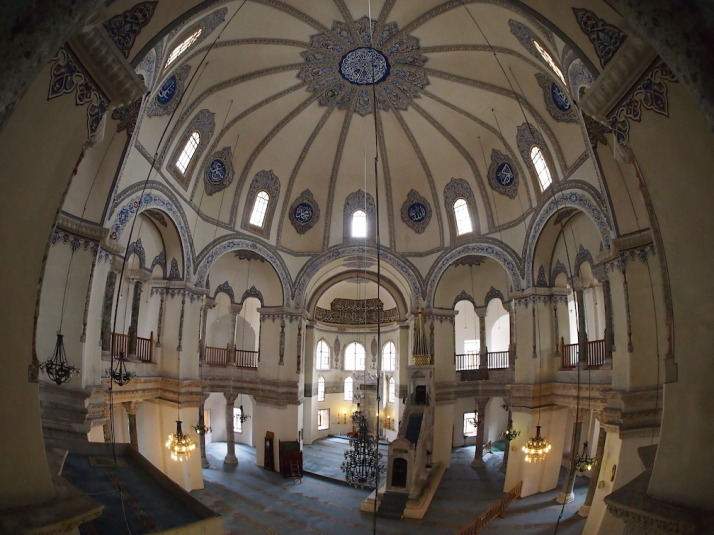 Built in 1741 by Sultan Mahmut I, the money it took was used for the upkeep of a library the Sultan built in Haghia Sophia. We ventured as far as the camekân, or reception room before returning to the stroll, but not until we’d made a note of some of the famous people that have partaken of the Turkish waters here: John Travolta, Cameron Diaz, Jenson Button, Brian May, and Kate Moss, to name a few! 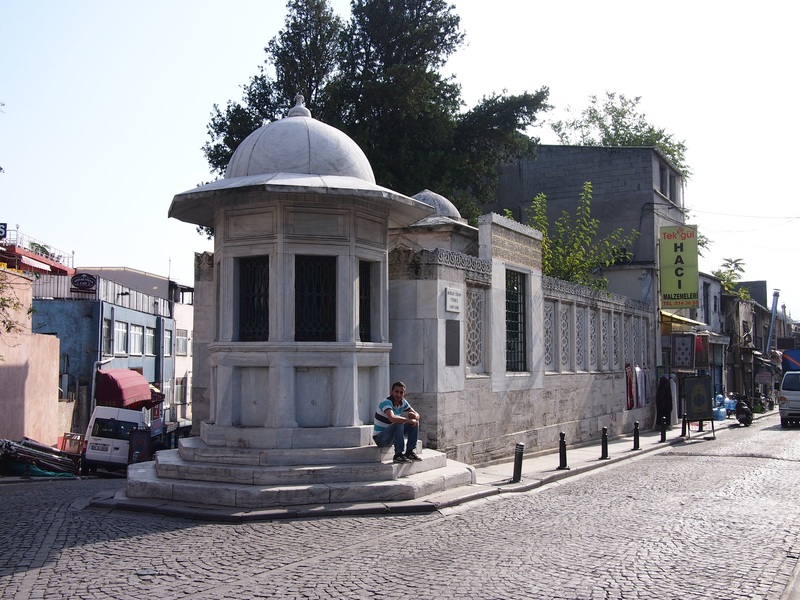 Once the gate that led to the palace and offices of the Grand Vezir where most of the business of the Ottoman Empire was transacted, it now leads to the Vilayet or the government of the Province of Istanbul. 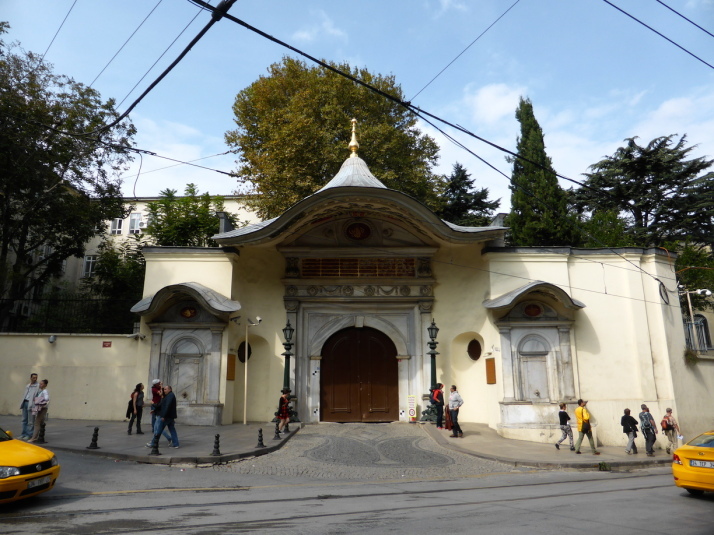 Interestingly, our guidebook says that the gate became synonymous with the Ottoman government itself and ambassadors were accredited to the Sublime Porte rather than to Turkey, just as to this day ambassadors to England are accredited to the Court of St. James. 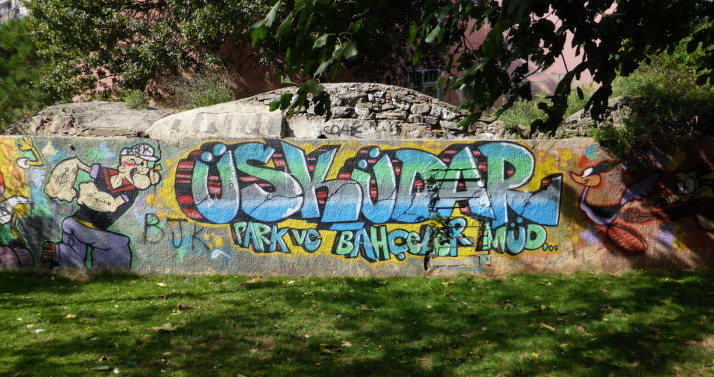 The Alay Köşkü, great for watching parades, keeping an eye on the state, or picking off your subjects.. 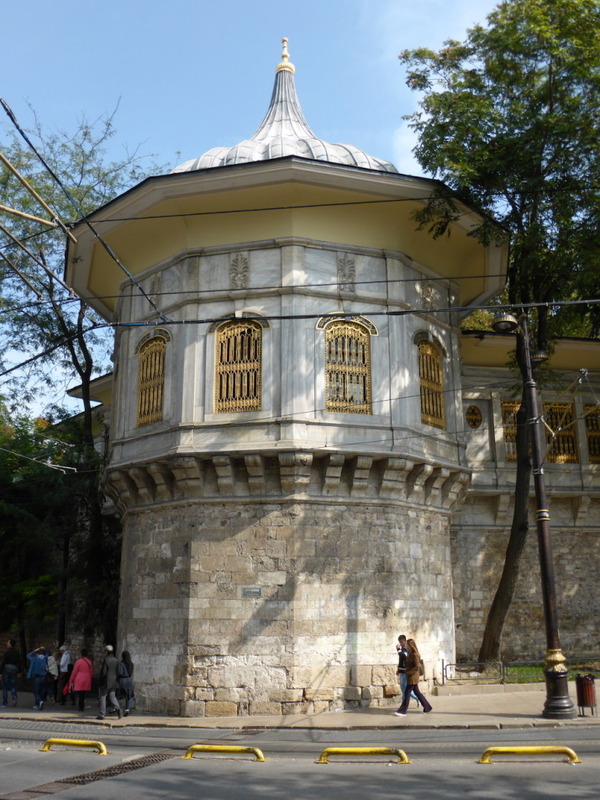 Directly opposite the Sublime Porte is a large gazebo called the Alay Köşkü which translates as Review or Parade Pavilion, and is a tower in the walls of the Topkapi Palace where the Sultan could watch the affairs of the Sublime Porte gate opposite. 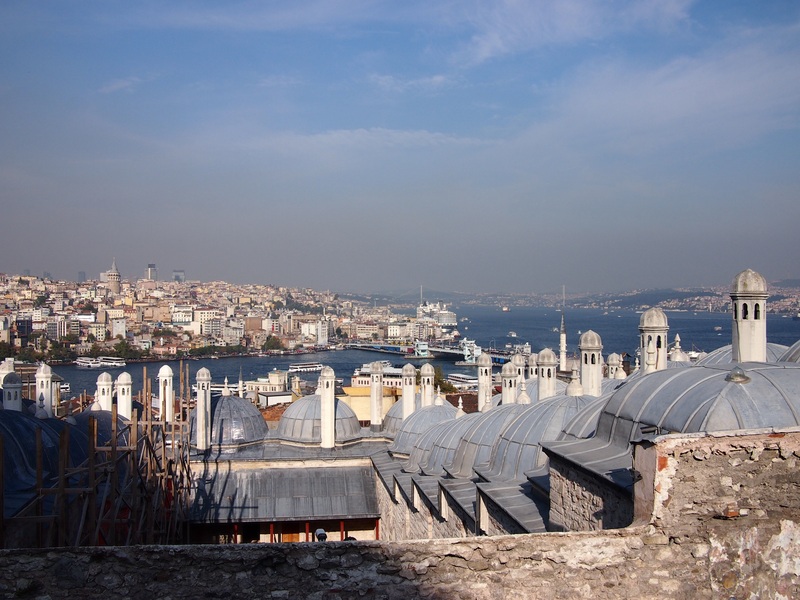 Our guidebook retells of one Sultan Crazy Ibrahim who used this vantage point to pick off pedestrians with his crossbow! The walk ends at the magnificent Haghia Sophia, which after seeing the queues outside we decided we’d leave for another day. 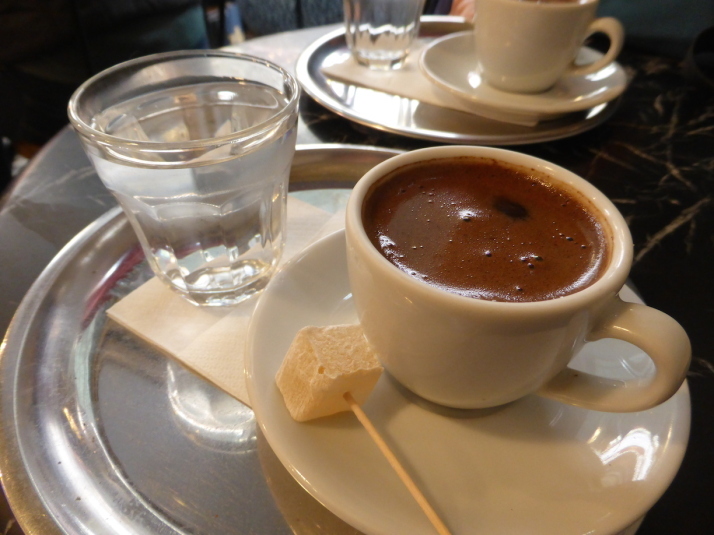 Though there was time for our first proper Turkish coffee on the way home..
Our first proper Turkish coffee in Istanbul. How do you know by looking at it? 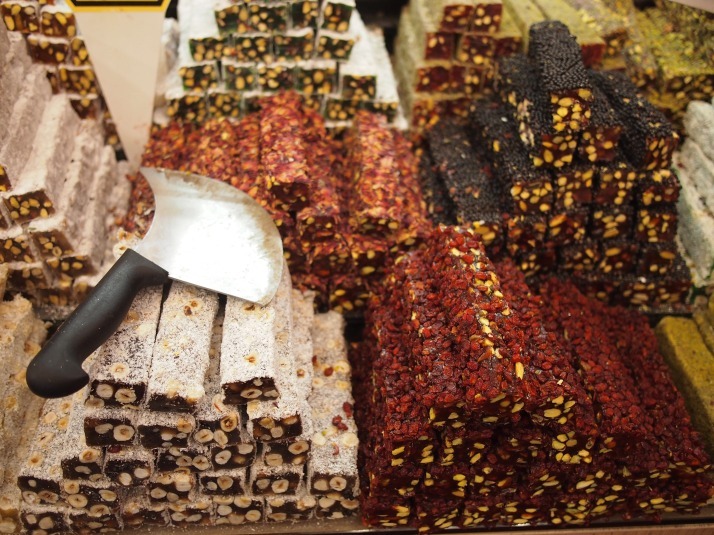 It’s the lokum or Turkish delight on the side of course! 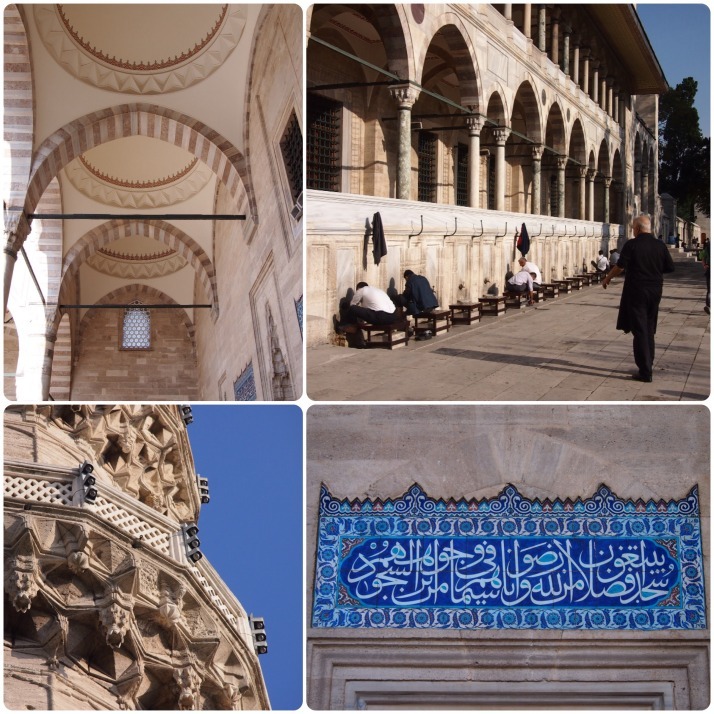 This entry was posted in Experiences, Places and tagged Istanbul, mosque, Strolling, Turkey on October 20, 2014 by Andrew.